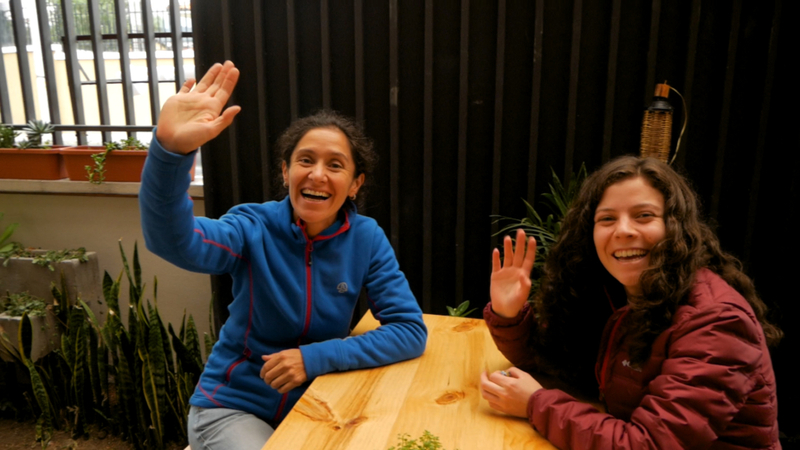 We’re back to business as usual with this Cuenca Ecuador Day In The Life video. 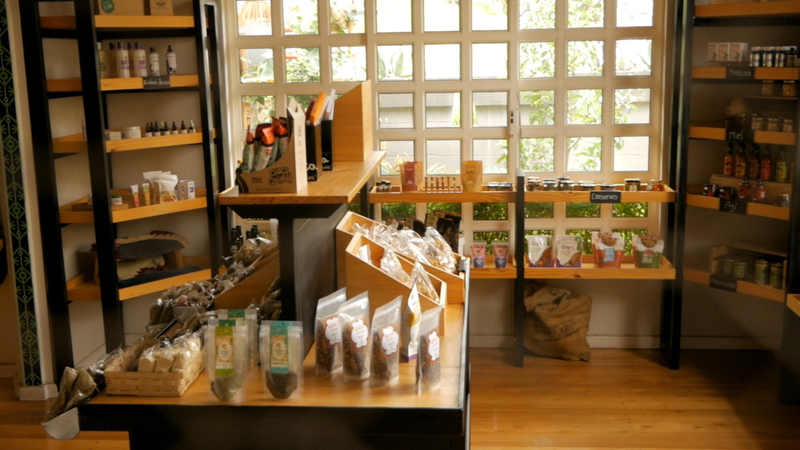 Several people have asked us about organic or natural stores here in Cuenca, so we show you two of them in this video. Plus, we had some delicious vegan sushi for lunch at Origami. As a reminder, we’re leaving for Amsterdam and India in a few days so our posting schedule will be a bit erratic. Please sign up for our newsletter and I’ll do my best to let you know when we’re going to post our next video. 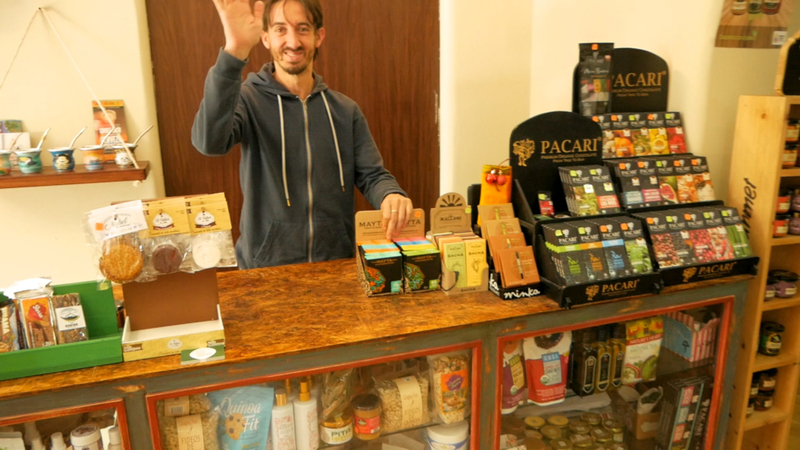 Our first stop was at La Chakra Mercado Natural on Doce de Abril near La Universidad de Cuenca and next to Samsara Yoga. They have all sorts of natural food and beauty products. They also have a La Chakra Facebook Page. We bought a bag of organic, locally sourced maca powder that we put in our breakfast oats. We also bought a protein snack bar from Panda Cakes Cuenca. 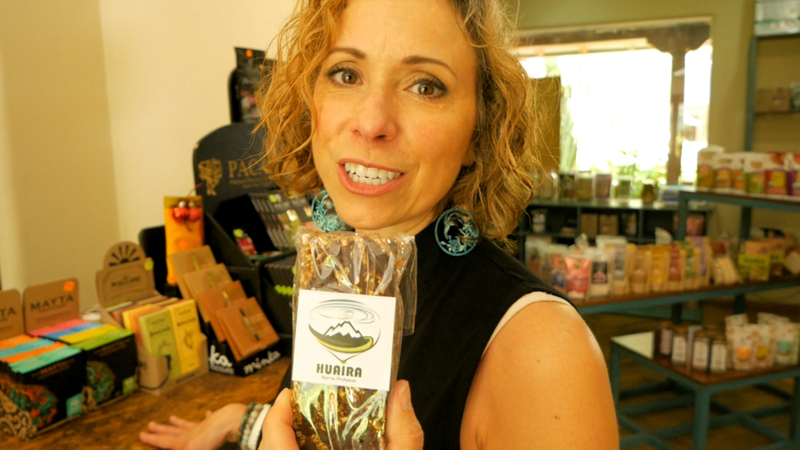 My vegan rock climbing friend, Pietro, makes those and sells them in natural stores around Cuenca. Amelia also bought some cruelty free natural deodorant, which is quite a bit more expensive in Ecuador than back in the states. 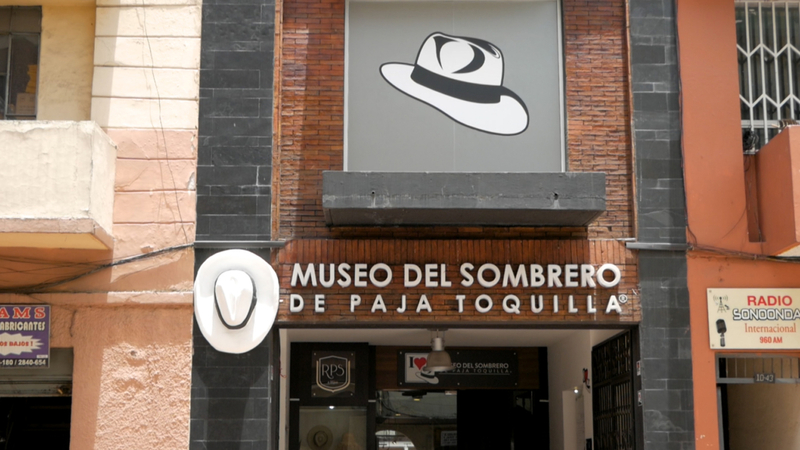 Our second stop was at Museo Del Sombrero to get my hat repaired. It got really wet while Stephen was rock climbing, which caused the band to come loose. 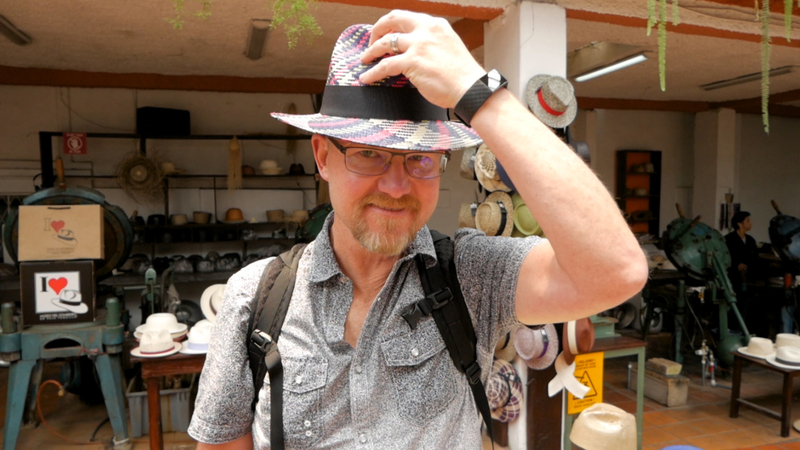 We love our panama hats and it’s really nice that they keep them maintained for free. Amelia and I tried on several hats while we waited just for fun. 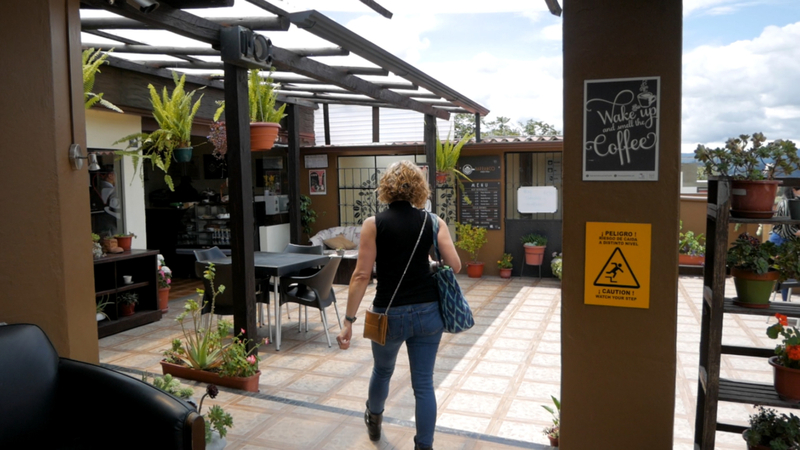 We also went upstairs for a cup of coffee and beautiful views of Cuenca. 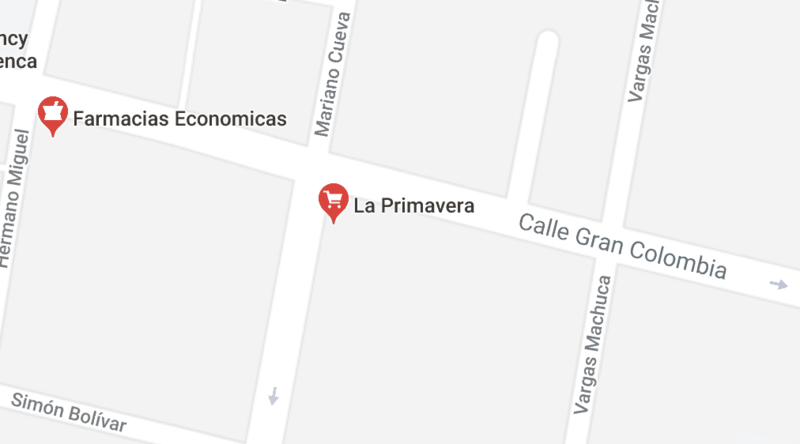 There are several La Primavera stores around Cuenca. They carry a variety of health foods, like protein powders, nuts, seeds, vitamins, etc. 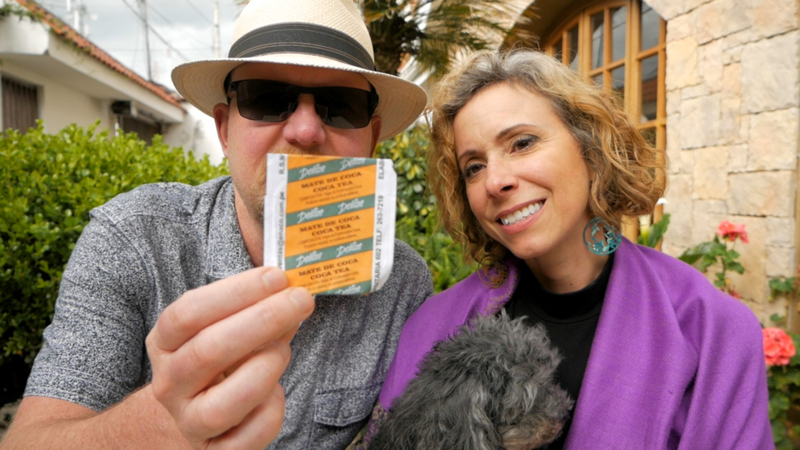 Our friends Jimmy and Sharon told us the one on Mariano Cueva y Calle Gran Colombia sold Mate de Coca or Té de Coca, which helps with altitude sickness. Sometimes I get a little light headed and short of breath when the weather changes, and this tea helps alleviate the symptoms. Unfortunately, they were out of the tea so we’ll have to try someplace else. 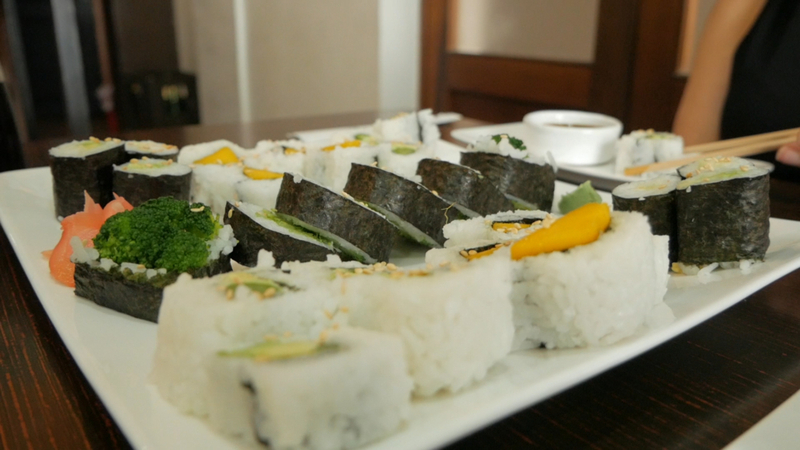 We like going to Origami Sushi in Cuenca because they have a lot of vegan options and it’s far less expensive than Noe Sushi. 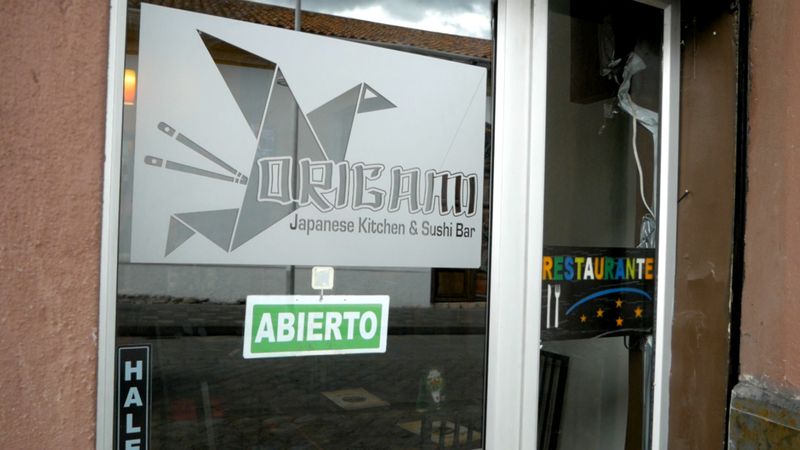 Origami is located on Calle Larga y Mariano Cueva. They have a tiny storefront that’s easy to miss. Just look for the Origami sign on the door. They have an entire page dedicated to vegetarian (it’s actually vegan) sushi rolls and options. 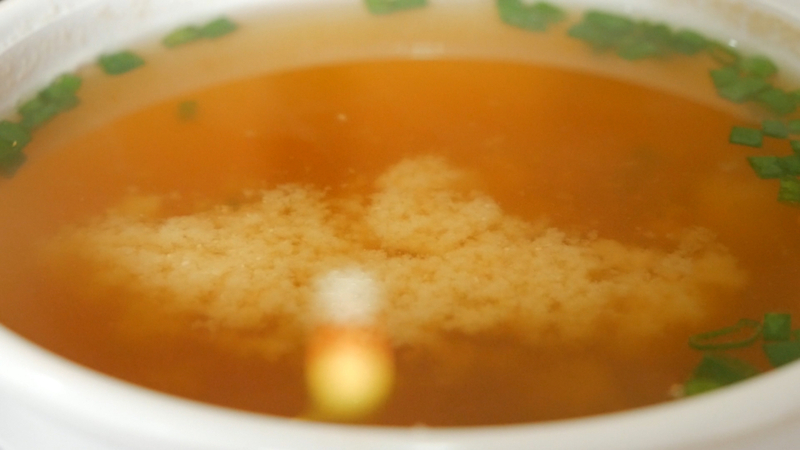 Plus, their Miso Soup is also vegan and they don’t use oil in any of the rolls or the soup. We ordered the Yasai Combination plus a Mango Roll. Hopefully you enjoyed our video, and if you did, please LIKE, COMMENT and SHARE it, and SUBSCRIBE to our YouTube channel. ¡Muchas Gracias y Hasta Luego! Let us know if you’d like to see more of these Day In The Life videos. They’re a lot of work to film and edit, but we really enjoy making them. 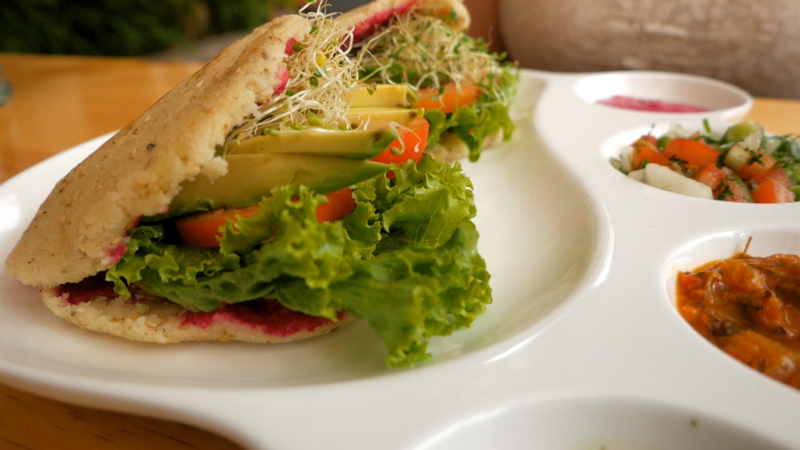 In this video, we walked over to YuraVeg for vegan lunch and then on to Gringolandia and Sukasa. We hope you enjoy the beautiful scenery and the interesting people we see along the way. Our friend Olesya recommended YuraVeg for some delicious, low/no-oil vegan food so we decided to give it a try. 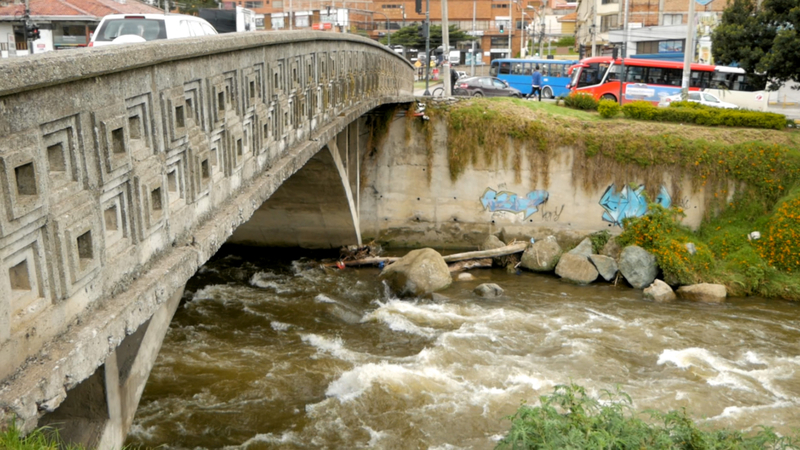 It’s about a 25 minute walk from our house in the Sucre neighborhood near Loja y Remigio Crespo Toral. YuraVeg is a vegan and vegetarian restaurant so be sure to tell them no queso, no huevo y no mantequilla. We had the Arepas Veganas, and they were AMAZING! For $5 per plate, we each got two arepas with 4 different sauces. Yum! We will DEFINITELY be adding this place to our regular rotation! 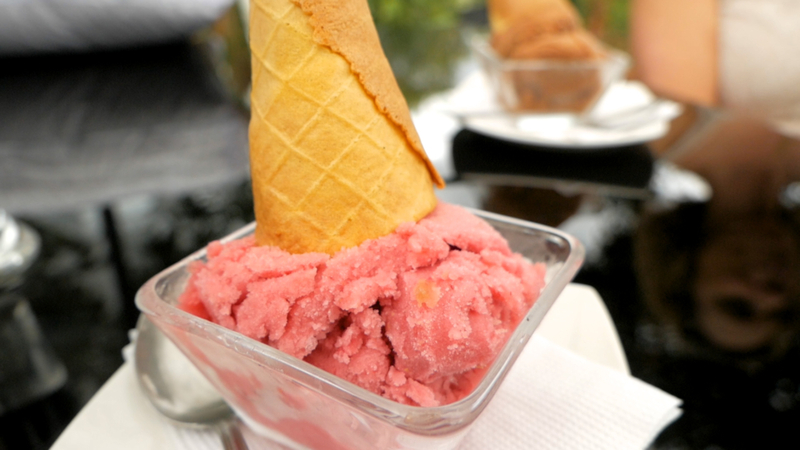 I had the helado fruta rojas and Amelia had the helado chocolate, as per usual. 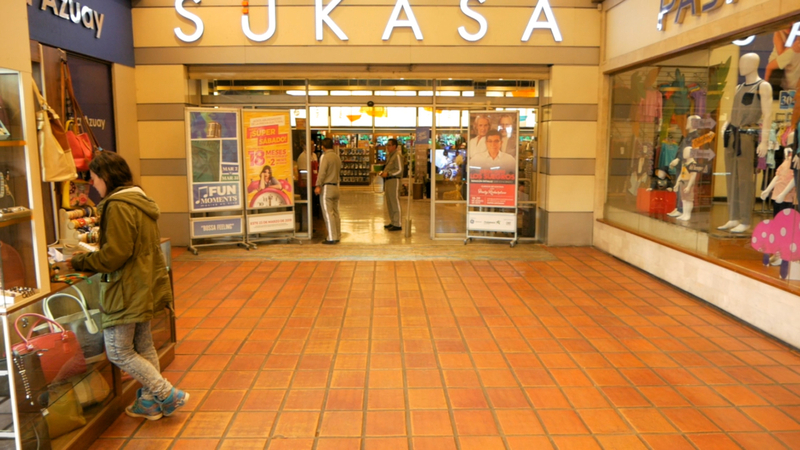 We were hoping to film inside Sukasa, but the guard at the front door said they have a store policy against it. I told him it would be promoción gratis (free advertising), but he said it wasn’t his call. El gerente (the manager) makes that call. Oh well. Their loss. We did find the queen-size mattress cover Amelia was looking for. The price on the package was $28, but it rang up en venta (on sale) for $18. What a bargain! Believe it or not, that’s not to protect the mattress from me. I rarely sweat. Amelia, on-the-other-hand, is experiencing hot flashes and night sweats. She’s only 50, but her mom also went through this phase of life early. 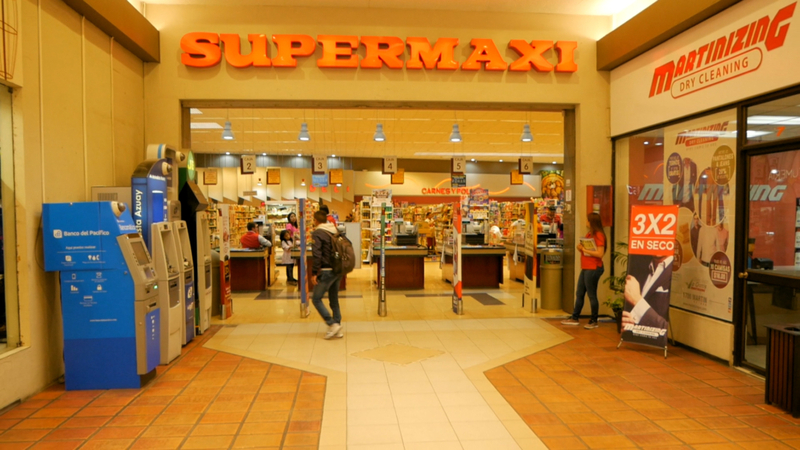 Sukasa is located in the same stripmall next to the Supermaxi in Gringolandia. Every time we leave the house, we bump into someone we know. That RARELY happened in Denver. 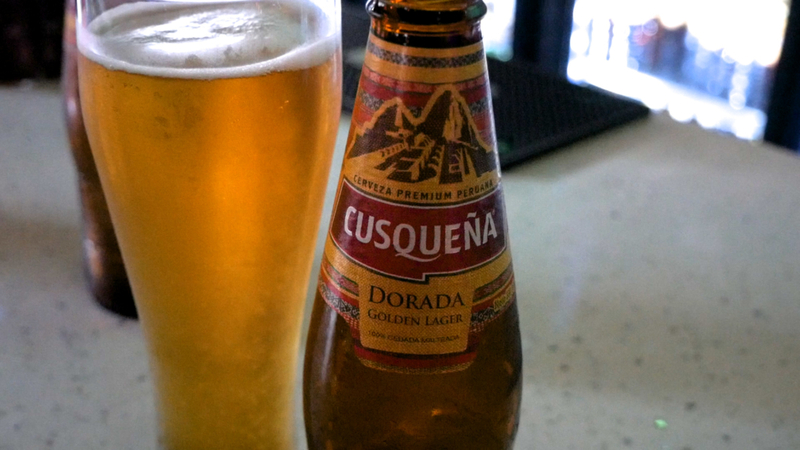 That’s one thing we love about Cuenca: it has all the amenities of a larger city, but it still has a small city feel. 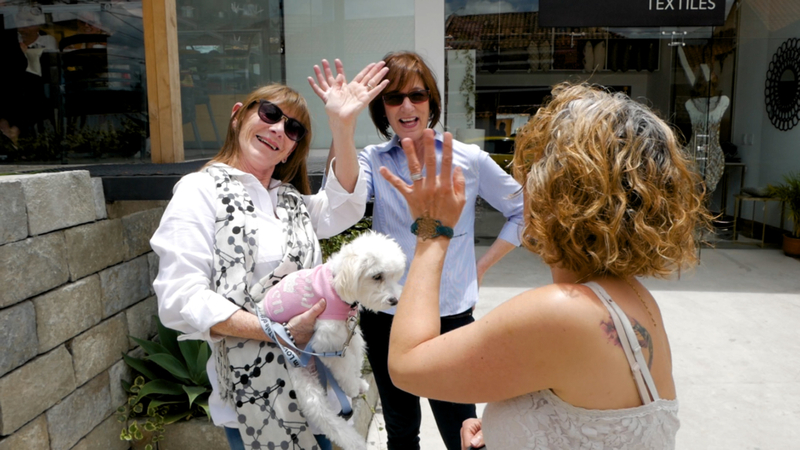 Pam (on the left) and her husband were the previous renters of our house. Amelia met Susan doing Belly Dance at The Tribal Fusion House. Samara and Samantha are Xavier’s wife and daughter. You met Xavier in our Apartamentos Otorongo video. There aren’t a lot of handrails in Ecuador and the sidewalks are a walking hazard. You ALWAYS have to pay attention when you’re walking. 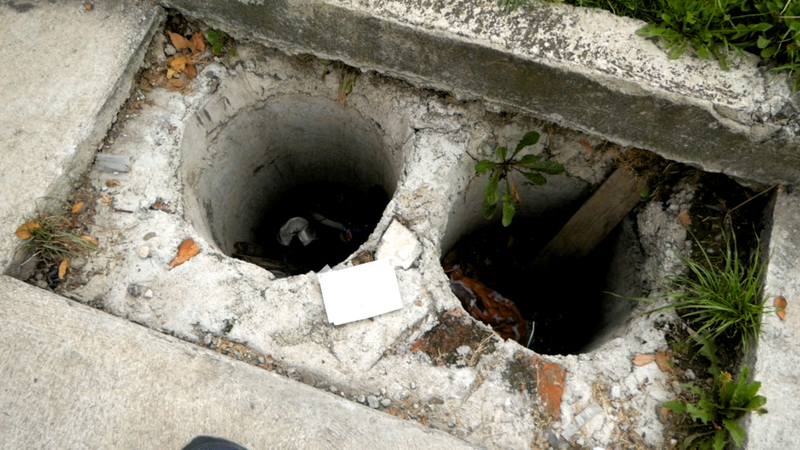 These post holes were on a relatively new sidewalk in Gringolandia near Sukasa. You could break your leg or ankle if you stepped in one of these! The retaining walls on the sides of bridges rarely have rails, so you could easily step off one of them and fall 15 or 20 feet, sometimes into a raging river. 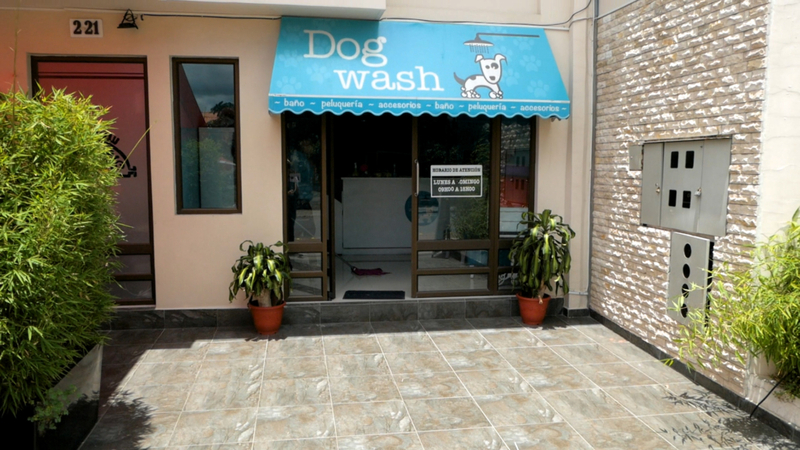 You may have noticed the Dog Wash in our video. It’s located on Calle Federico Proaño, La Salle 2-21. We took Daisy there a couple times before Jessica at Maxi’s Pet Care started offering grooming services. We were very happy with Daisy’s bath and it was very affordable. The sign says a wash starts at $6, but that’s for small dogs. I believe Daisy was $10. 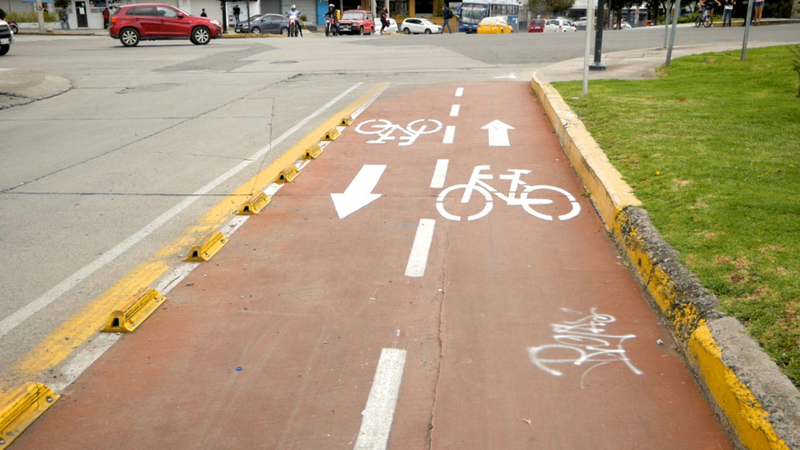 One of our regular viewers asked us about bike lanes in Cuenca. You’ll notice a LOT of them in this video. 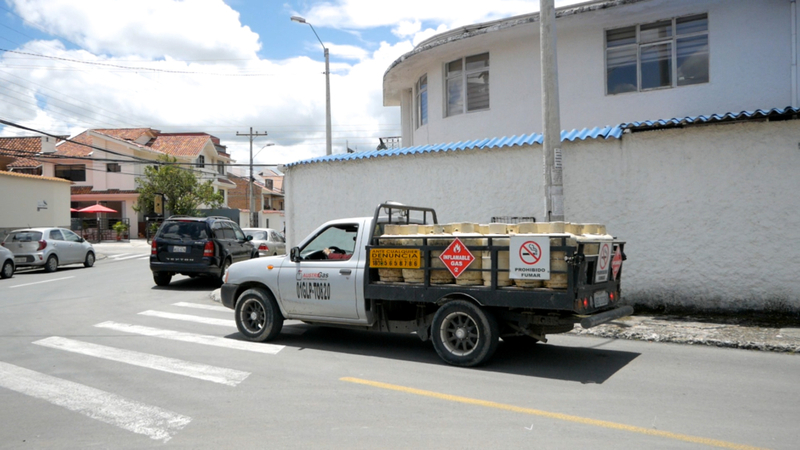 Cuenca has been adding them throughout the city for several years as part of a health and environmental awareness campaign. Pacha Kuna is an organic market located next door to YuraVeg. It’s closed on the weekend so we’ll have to go back another day to give you the full tour. Coworking spaces are very popular here. 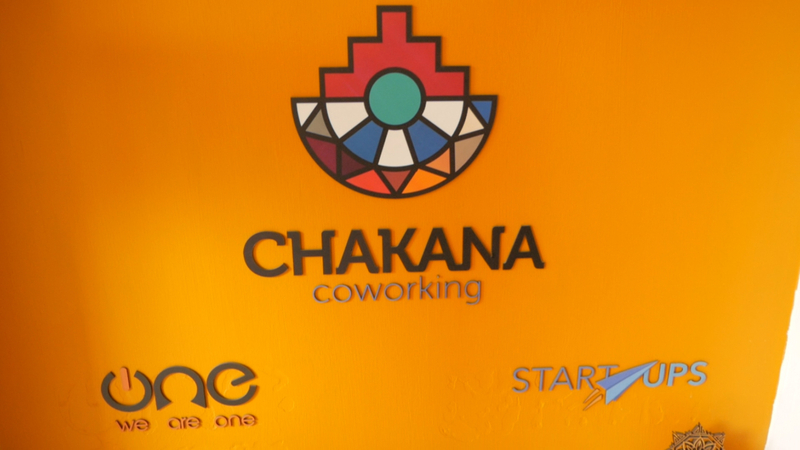 Chakana Coworking is located in the same building as YuraVeg and Pacha Kuna. Ecuador is a bit behind the technological curve, but they’re working hard to catch up and I’m guessing coworking places like this are helping. We video a lot of clothing storefronts to show that Cuenca and South America is a modern city with modern fashion. 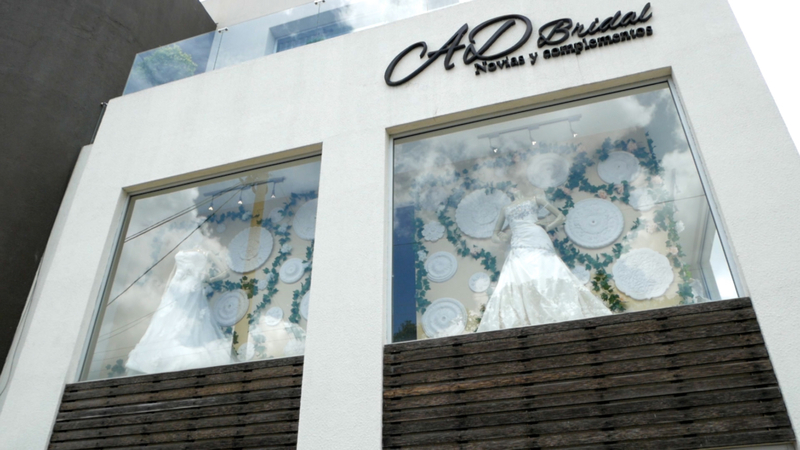 Weddings are also a huge thing here, so there are lots of bridal shops. I can’t find a website for this one, which is common in Ecuador. Most places at least have a Facebook page, but I couldn’t find one of those either. 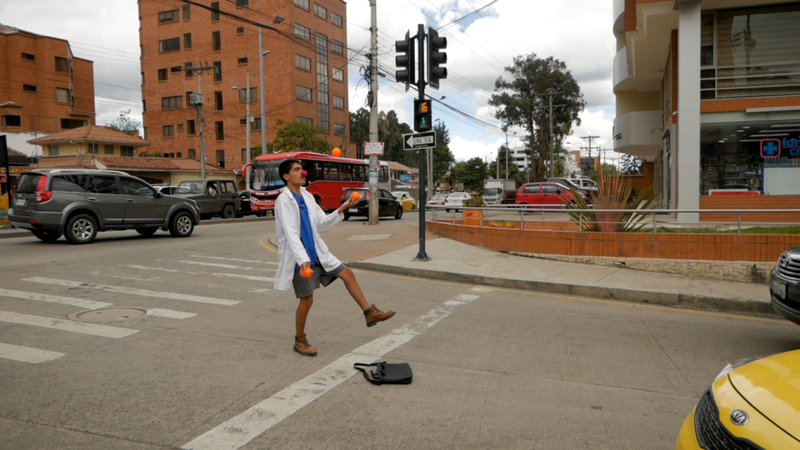 Most major intersections in Cuenca have entertaining street performers. You’ll see everything from guitar players to firebreathers to jugglers with clown noses. And they’re extremely talented! 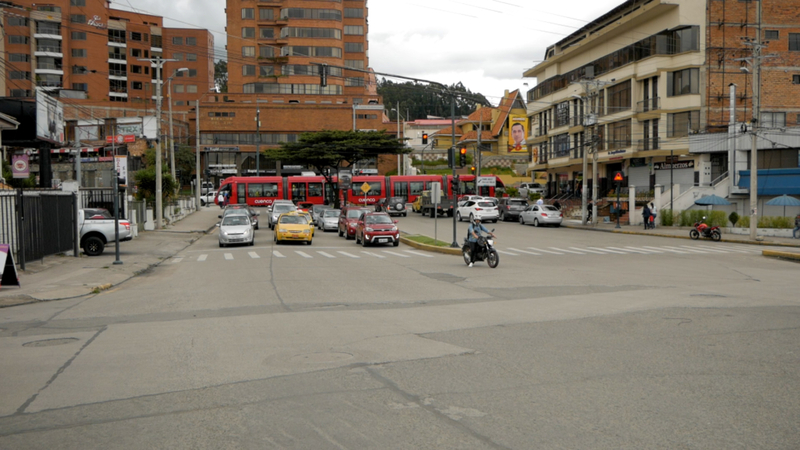 We don’t live near the new Tranvía rail system here in Cuenca so we haven’t filmed it in operation until recording this video. We’ll take a ride on it at some point to give you the full experience. We’ve talked about the gas trucks in a few of our videos, but we were able to record part of the song today. If you’re curious about the song lyrics, I spent several hours one day translating them: Cuenca Gas Truck Song Lyrics & English Translation. 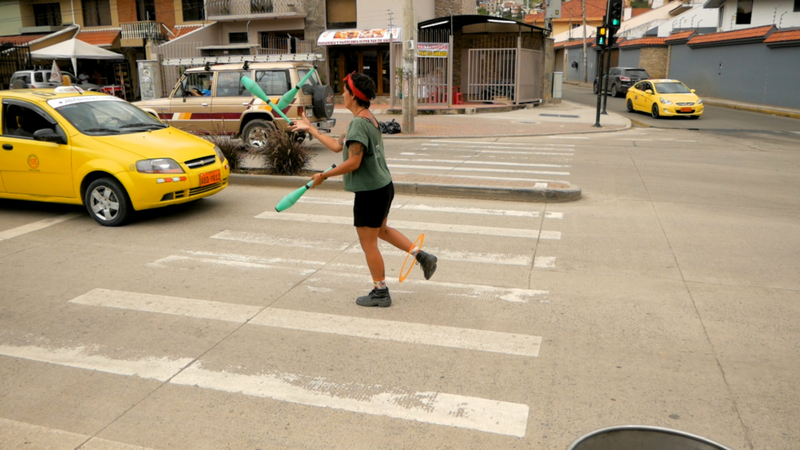 This day in the life video is a walking tour of the San Sebas (or San Sebastian) area of Cuenca Ecuador. Our first stop was at Marc’s Consignments. 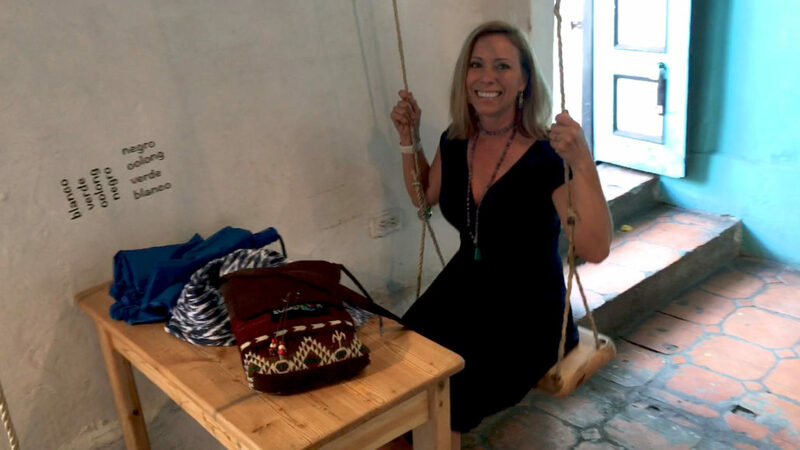 One of our very first subscribers, Marla, will be moving here to Cuenca in June and she requested a tour of one of the consignment stores. 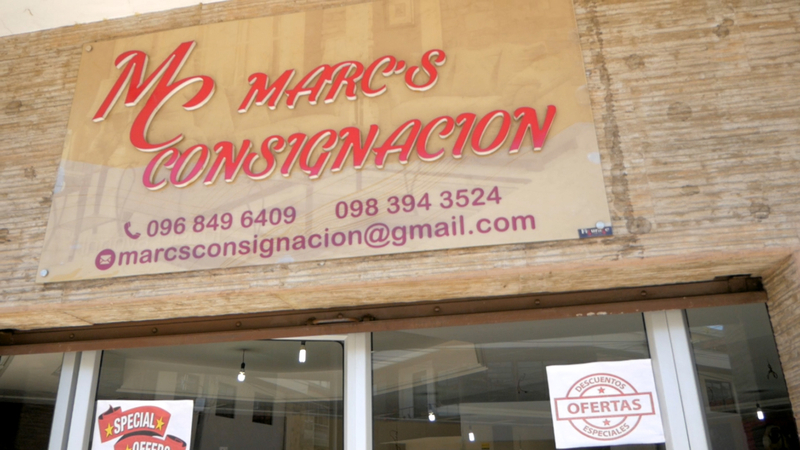 Marc’s Consignments is located in the San Sebas area of Cuenca just a couple blocks from San Sebas plaza. In addition to brokering furniture sales, they can also help with relocation services. And if you need something special that they don’t have, they can find it for you. Their stock rotates about every 2 months and they get new items every week so check back often. 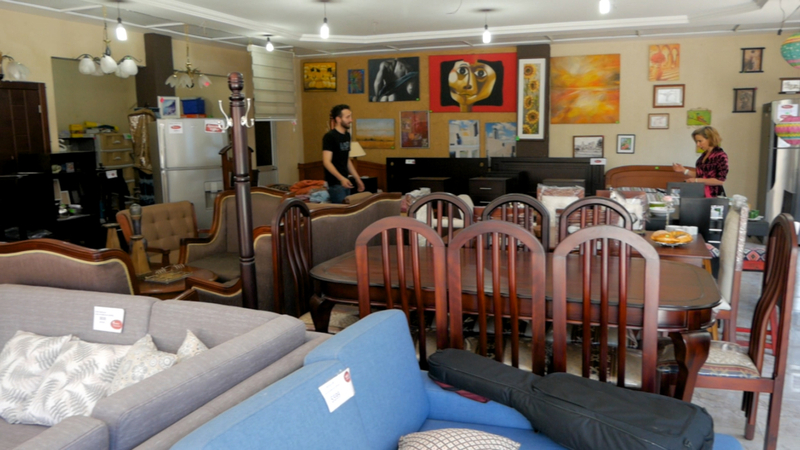 There are two other consignment stores that we know about that are popular with gringos: Cuenca Consignments and JD Muebles. We’ve never been to Cuenca Consignments, but JD Muebles is very similar to Marc’s Consignments. One of the prettiest, old-world plazas in Cuenca has to be San Sebas Plaza. 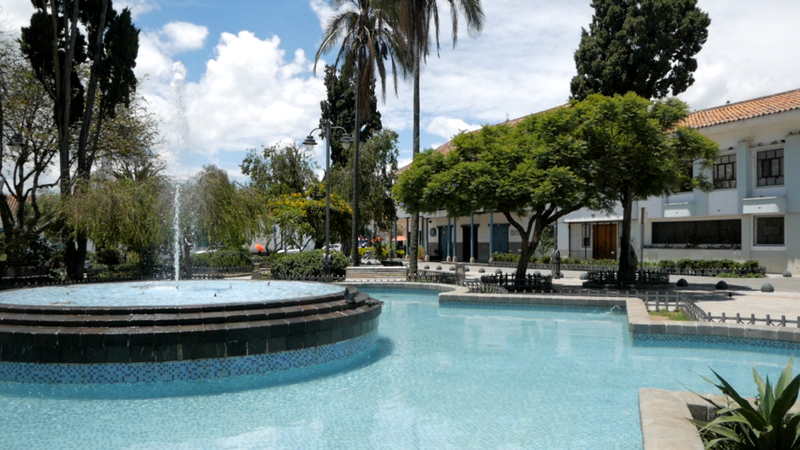 Locals and gringos alike are often seen relaxing near the fountain, surrounded by flower gardens. Café San Sebas is popular gringo hangout with a nice patio and views of the plaza and the Museum of Modern Art. 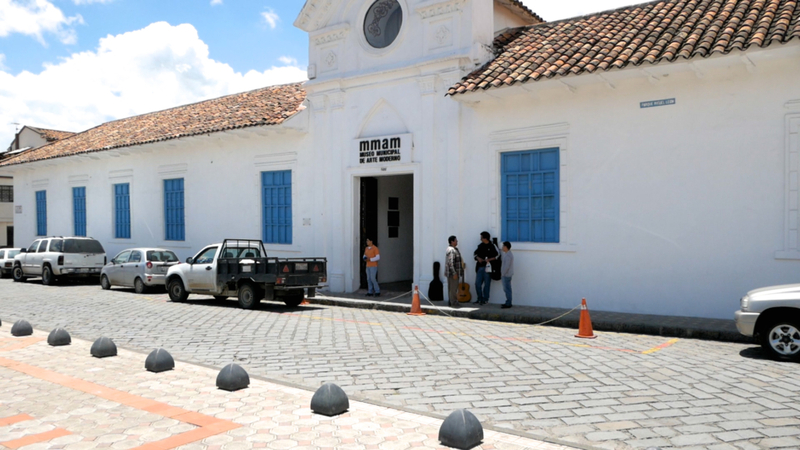 We’ve been to Cuenca’s Museum of Modern Art several times. 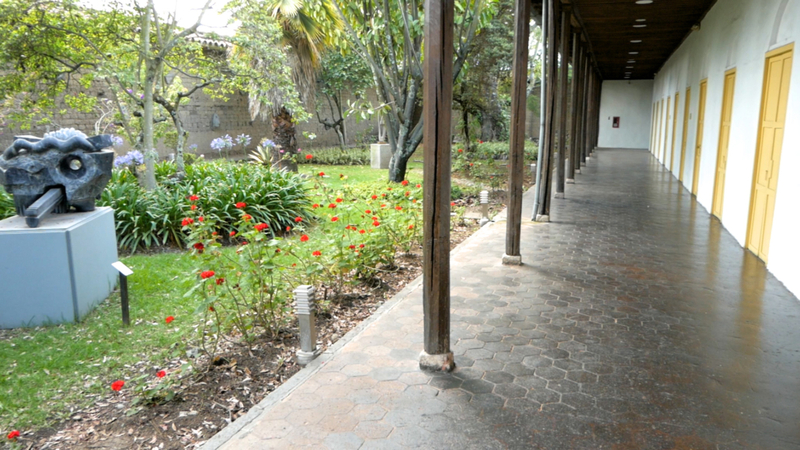 It’s a beautiful, quite and relaxing art museum with several colorful gardens. However, on this day, there weren’t any art exhibits. The museum is in the process of doing a comprehensive renovation so none of the art was on display except for the outdoor sculptures. We still enjoyed ourselves none-the-less. 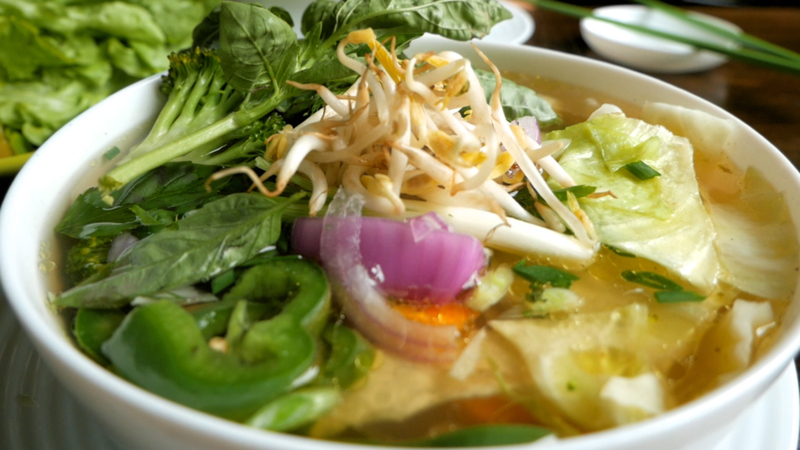 After we left the museum, we walked a couple blocks to Pho Vietnamita for lunch. 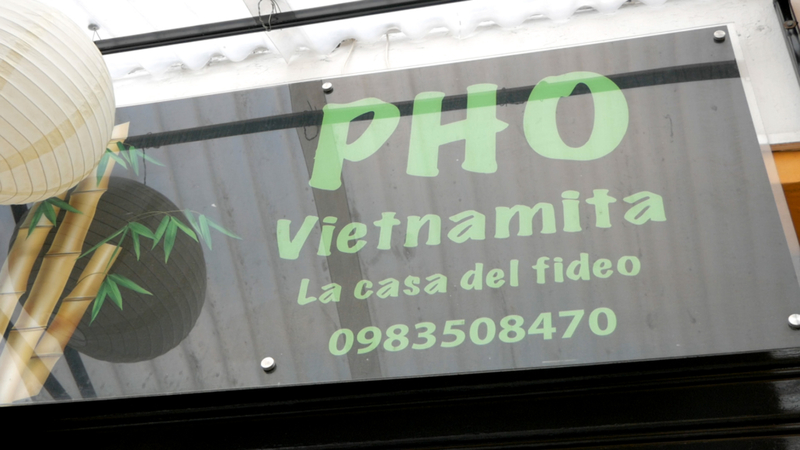 As far as we know, this is the only Vietnamese restaurant in Cuenca, and it’s muy delicioso. 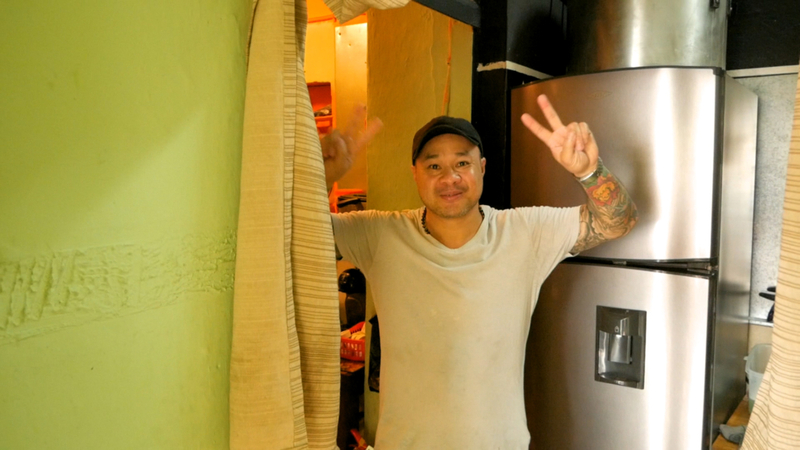 We met Rick, the head chef and owner, during our Visa process. We rode to Machala together to file our paperwork soon after we arrived in Cuenca. 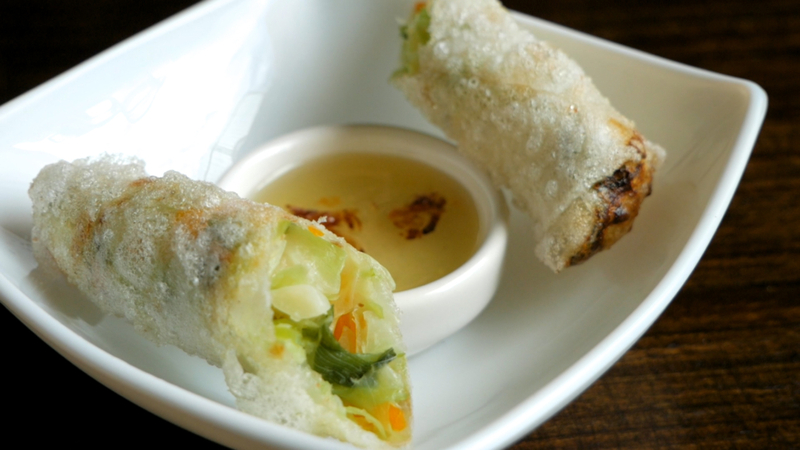 Rick made us some delicious vegan rice paper spring rolls as an appetizer. We ordered the Vegetarian Pho, which is actually vegan, for our main course. The Vegetarian Ramen uses egg noodles, so it’s not vegan. The Pho bowl was very flavorful and filling. After we left Rick’s place, we walked down Simón Bolivar toward Parque Calderon. 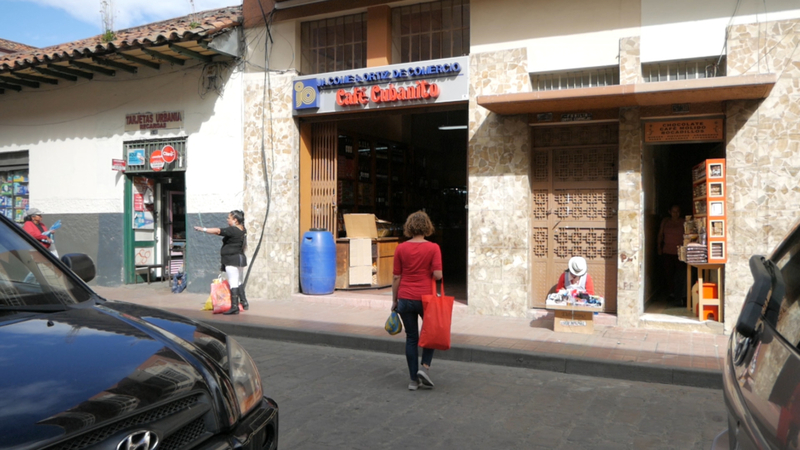 If you’re in the market for unique furniture and home decor, the INTI-RAYMI Galeria might have what you’re looking for. They have more furniture on the upper level so be sure to check that out, too. 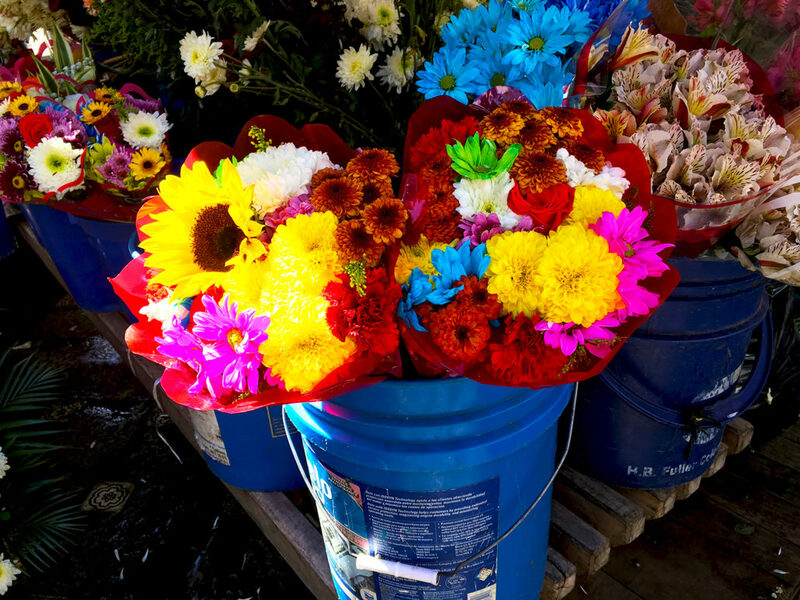 A walk through El Centro wouldn’t be complete without a trip to Cuenca’s world famous Flower Market. After we left the flower market, a dark cloud appeared from out of nowhere (as they often do here in Cuenca) and the sky opened up. We stepped inside Fogón del Zorro just as it started pouring rain. They do have a few options on the menu for us vegans, but since we had already eaten, we just ordered a delicious Peruvian beer to sip while we waited out the storm. Amelia still works for a company based in Denver, CO and she goes back for a week four times per year. Time goes very slowly while she’s gone and I’m always very happy when she returns! After sleeping on comfortable beds at her parents’ house and in hotels for 11 nights, Amelia told me it was time to finally buy un colchón nuevo (a new mattress). We were planning to go shopping the afternoon that she returned to Cuenca, but after a long day of travel and an early morning flight back to Cuenca from Quito, she was too tired to go shopping so we went the next day, instead. 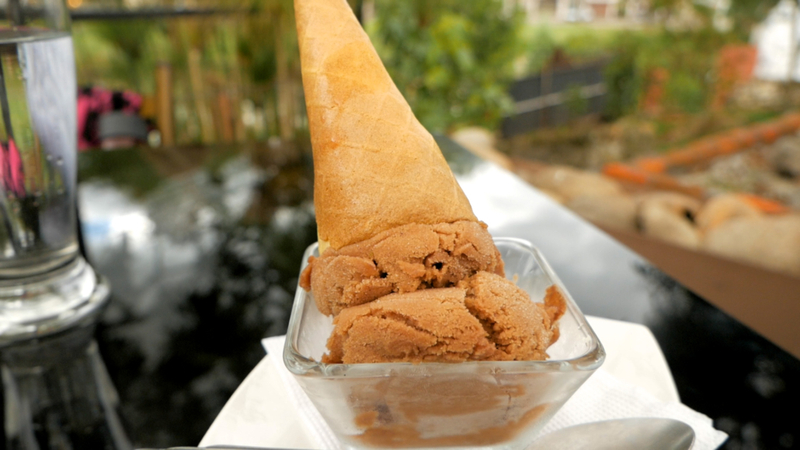 My physical therapist, Karina, told us to buy un colchón nuevo several months ago, but we kept putting it off. The mattress that came with our rental house is very old and not supportive, which we believe has been contributing to my back pain and Amelia’s hip pain. 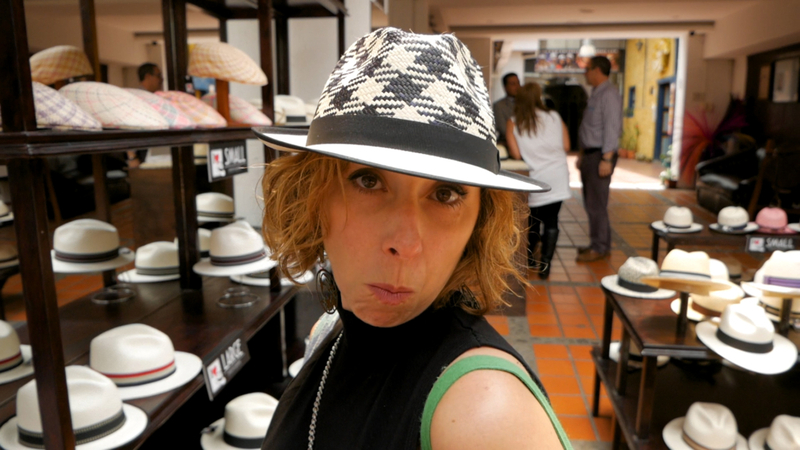 For some reason, though, we were intimidated to go shopping for un colchón. Karina recommended we go to Muebles Vera Vázquez in the San Sebas part of town and look at colchones de Chaide. She said that was a good Ecuadorian brand of mattress. We tried several and found one we liked. The store is currently under massive construction, which is why it was so crowded and noisy. The store occupies six floors in an old building, and they’re in the process of doubling the size with an expansion. They said it would be completed in two months, but I find that very hard to believe. There was literally NO building next door. They had completely torn it down to the ground. If they finish rebuilding that in two months, I’ll be very impressed. UPDATE: Our first night in our new bed was heavenly! It’s 100 times better than the old mattress. My back and Amelia’s hip already feel better! Amelia is on an airplane. So she should be here shortly. >> JP: Do you have enough luggage? >> JP: I think you need some more luggage. needed to get a new mattress. 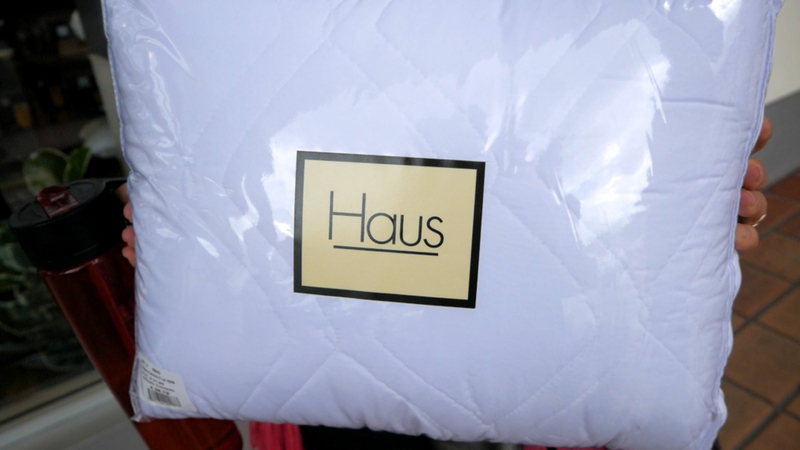 a mattress that we love. >> A: This is king, yeah? It’s hard to tell. It’s comfortable. Do you wanna lay on it? >> A: Yeah. I kinda like it. >> JP: What do you like about it? >> A: It feels more supportive. I keep wanting to say Vera Cruz. and we found one that we love. deliver it for us tomorrow morning. and therefore it was $690 with delivery. Yay! And we only had to pay 50% up-front. all weather gear, but we didn’t. We didn’t bring any umbrellas. that they are renovating right now. and they will double their retail space. Thursday and Saturday at 2PM Eastern. We had to do a little walkin..
little Tetris style. Not Tetris style. Tetris style is the compacting. You can cut that out. Do you want me to start over? >> JP: No. What would that be like? >> A: I don’t know. A maze? >> A: No. I don’t know. It was a tight squeeze. 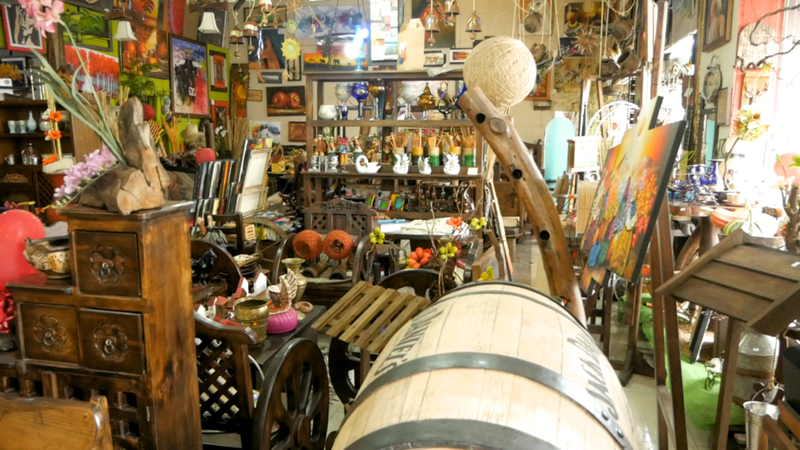 While Amelia’s back in the States, I filmed el Mercado de Artesanias Rotary here in Cuenca. It’s usually just called “the rotary” by the gringos and it’s located at Vargas Machuca y Gaspar Sangurima just one block East of Mercado 9 de Octubre. The Rotary has lots of mostly indigenous vendors selling furniture, metalwork, hand-woven baskets, pottery, kitchen utensils, clothes, bags, rugs, souvenirs, etc. It’s a great place to find unique gifts for your loved ones, or obscure items for yourself. One of our viewers from the other side of the world (Taiwan) requested a video on this outdoor marketplace and filming it was a good use of my alone time. If you would like us to film something in particular, please let us know. As long as it’s relevant to our audience, we’ll be happy to record it! If you’ve never been to Cuenca or a South American country, you may be curious about basic things like paying bills and shopping at pharmacies. In this video, we’ll show you the unusual (by American standards) way of paying bills and perhaps reassure you about the quality of pharmacies here in Cuenca. 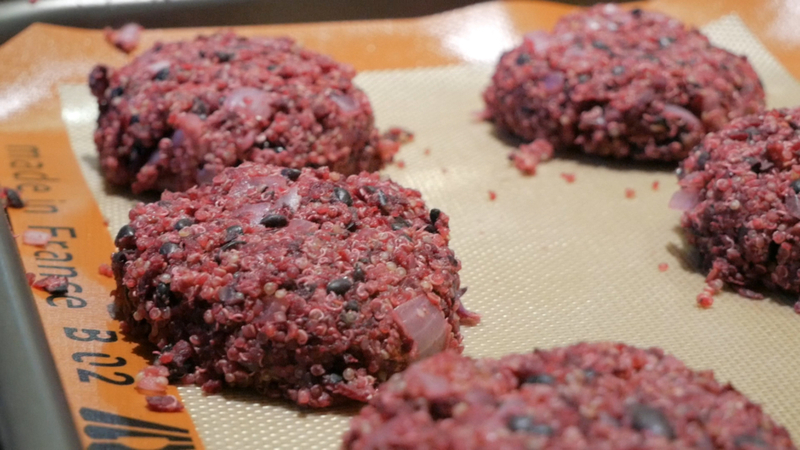 We’ll also share our Beet Burger w/ Black Beans & Quinoa recipe in a cooking video. You can find the full recipe on our sister recipe website, LottaVeg.com. The process for paying our utility bills here in Cuenca has been a constant learning process. We used to pay for our water, electric and landline at the Farmasol pharmacy near our house, but they stopped accepting utility payments for some reason. Now we go to JEP Cooperativa, which is a co-op bank here in Ecuador. JEP only accepts cash and they don’t accept our American ATM bank cards, so we have to go to a regular non-coop bank first to get cash. 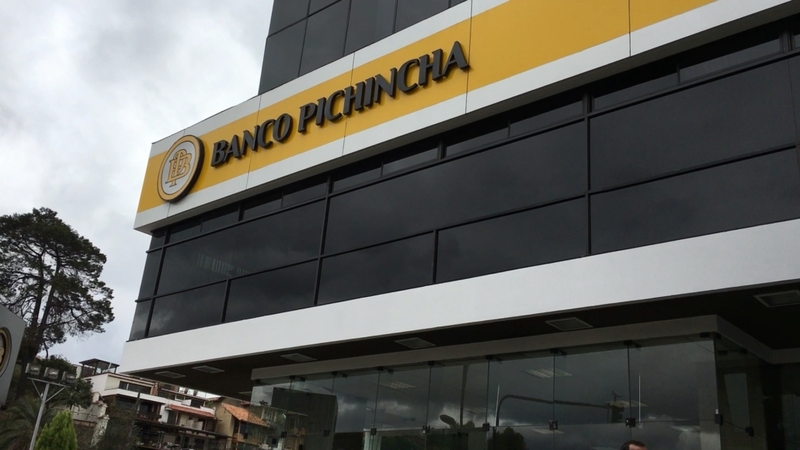 We prefer Banco Pichincha because they don’t charge ATM fees. Our utility bills run about $60/month: $40 for electric, $15 for water and $3 for our landline phone that came with the house. For reference, we have a single family 2-story home that’s about 1,500 square feet. Some landlords include the cost of utilities in the rent, but ours doesn’t so we have to pay them ourselves. We use Puntonet for our Internet access, which costs us $35/month for high-speed, fiber to the curb. It’s FAR better here than our crappy Comcast service back in Denver. We pay Puntonet with auto-pay using a credit card (no international transaction fees). We use Claro for our Ecuadorian mobile phone. It only costs us $17/month! We bought a cheap Samsung phone for $170 when we setup the account, but it was awful. We still have iPhones with Verizon back in the states (we both still work, Amelia for a company in Denver and I have web design clients) so after we upgraded our iPhones, we swapped the SIM card from the Samsung to our old iPhone and it works much better. We’ve tried setting up auto-pay at Claro using our credit card multiple times, but it never works so we go every month in person to pay. When you go in the front door, you have to get a number and wait your turn. 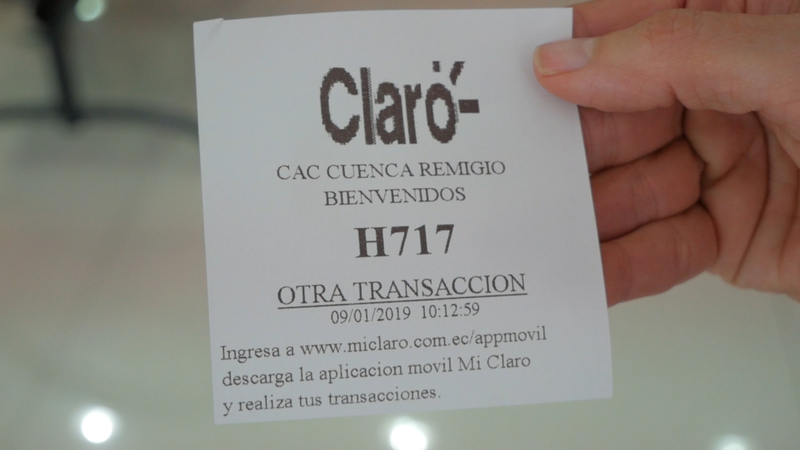 They ask for your Claro phone number at the front desk, but it doesn’t get recorded on the ticket so you have to repeat it to the clerk who takes your payment. It usually takes less than 15 minutes to pay. In the video, Amelia mentioned that our electricity got cut off one month. That was due to the confusing nature of bill paying here in Ecuador. There is no online access to bills, so we don’t know what the amounts due until we go to JEP. Furthermore, the bills are only available after a certain day of the month, which has been changed several times in the year we’ve been living here. The bill available dates are currently between the 1st and 5th of the month (it varies). However, they used to be available between the 19th and the 24th, then the 24th and the 29th. If you go before that date, the bills aren’t available so you can’t pay them. That’s where the confusion arose with our electricity getting shut off. We went to Farmasol to pay our bills (before they stopped accepting payments) and the electric bill wasn’t available yet because they changed the available date. We figured we would save a trip and just pay for it next month after several friends told us paying a month late wouldn’t matter. The next month, we paid our bills after all of them were available, but they cashier didn’t charge us for the previous month’s electricity. The next month, Farmasol stopped accepting payments and our payment dates changed AGAIN when JEP took over. The missing month still hadn’t been paid so on our first trip to JEP, they charged us for the missing month and the current month, but when we got home, our electricity had been shut off already for non-payment of the bill three months before. Thankfully, our landlord happened to drop by and we told him what happened. He took our JEP payment receipt to the electric company showing that we had just paid the late bill and our electricity was turned back on a few hours later. We didn’t cover how we pay rent in the video, but it’s worth a mention. This is a cash society. We haven’t seen personal checks, online bill pay is still in its infancy here, and most individuals and small businesses don’t accept credit cards. So in order to pay the rent, we go to the bank, withdraw cash from the ATM and deposit it directly into our landlord’s bank account. He gave us his account information and we use it to fill out a deposit slip. Paying the bills and the rent is a great way to get our 10,000 steps in for the day! 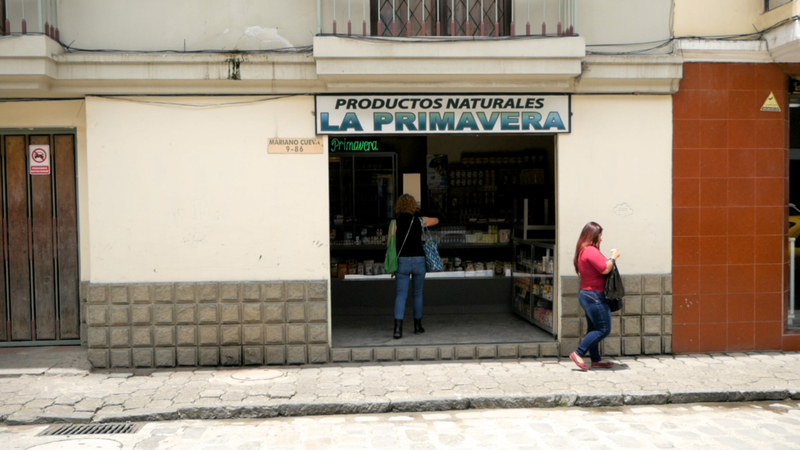 Pharmacies are abundant here in Cuenca and throughout Ecuador. For some reason, Ecuador hasn’t gone through the corporate consolidation process like the states has so there are lots of consumer options here. 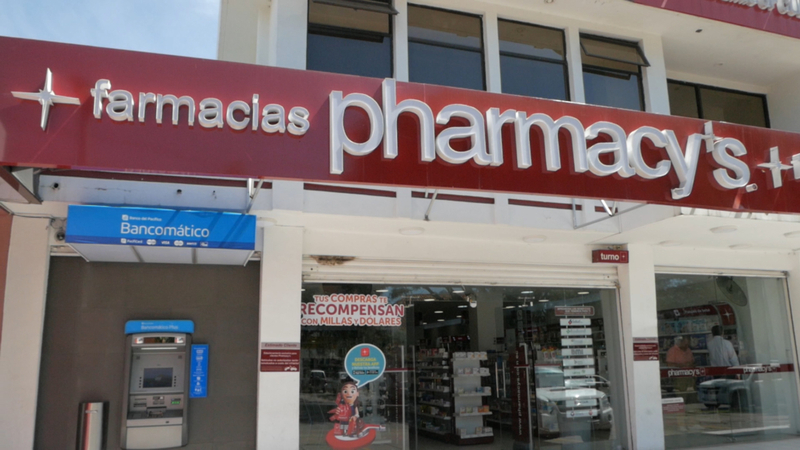 Within walking distance from our house, we have a Cruz Azul, Pharmacy’s, Fybeca and Medicity. And we’ve seen others. 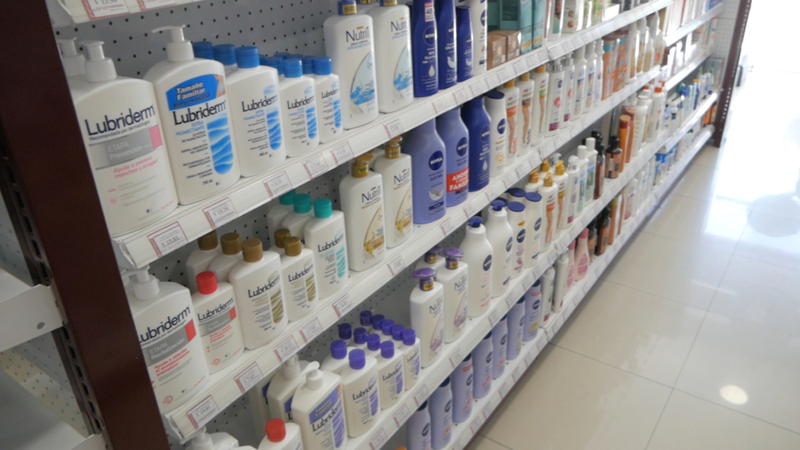 In the video, we toured a Pharmacy’s, but most of the larger pharmacies are pretty similar. They’re a lot like a Walgreens or CVS back in the states and they have a lot of the major brands. Most of the beauty products are a LOT more expensive here. 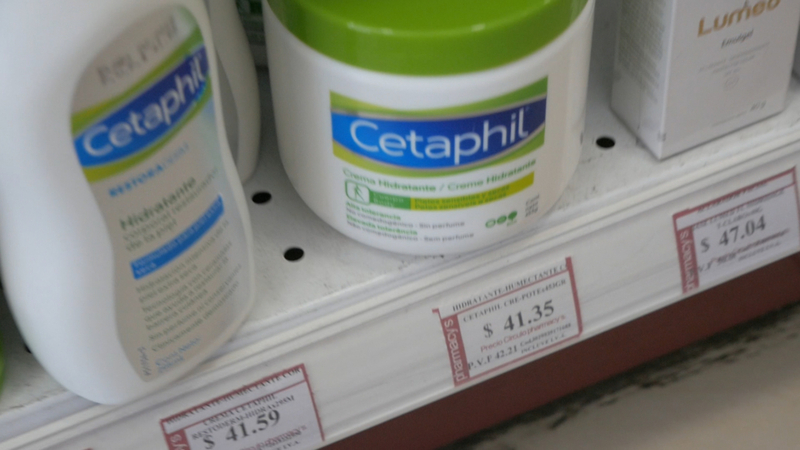 My physical therapist has us bring back Cetaphil for her because it only costs $11 in the states compared to $41 here. Most of the packaged medicines and vitamins are kept behind the counter so you’ll need to ask for them. 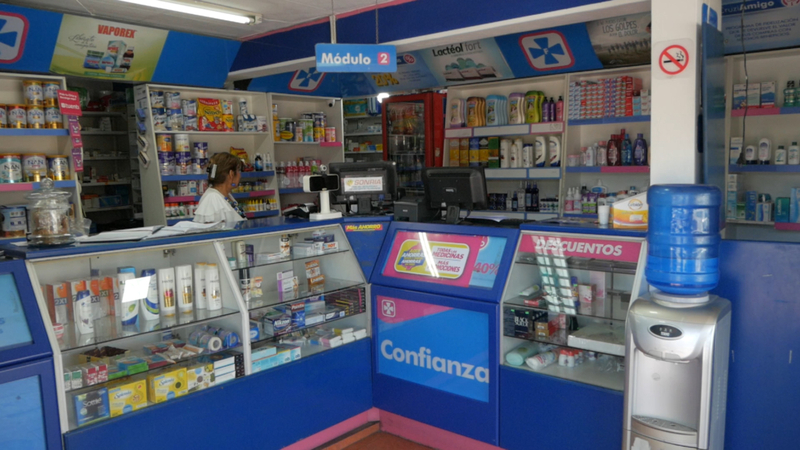 In the smaller pharmacies like the Cruz Azul in our neighborhood, nearly everything is kept behind the counter. If you would like us to look for something in particular, just let us know. Núcleo is a drug that’s available in most countries, but not the United States. This drug helps regenerate damaged nerves and the protective sheath around nerves. It also helps with neuropathy from nerve damage or diabetes. And from my experience, it actually works without side effects and only costs me about $45/month. Due to my spinal issues, I have nerve damage in my hands, legs and feet. The neuropathy in my feet was really bad before I started taking Núcleo several months ago. I’ve also regained some of the lost feeling in my hands and legs. It’s difficult to say for sure if this is solely due to the Núcleo or if part of the improvement came from my stellar physical therapy here in Cuenca or the natural healing process. Regardless, it’s unacceptable that this isn’t available in the states when it’s available in most other countries. It could help millions of people suffering with nerve damage or diabetic neuropathy. I was prescribed Gabapentin following my surgeries, but the side effects, especially depression, became unbearable so I had to stop taking it. Núcleo would have really helped me. 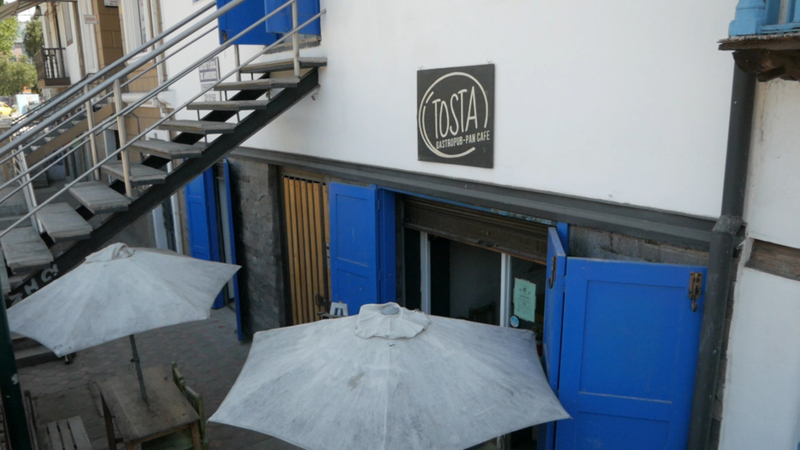 On our way home from paying our bills, we stopped by Tosta for some delicious sourdough bread. We timed it perfectly because it was straight from the oven and still warm! Yum! Hopefully you enjoyed our video, and if you did, please LIKE, COMMENT and SHARE it, and SUBSCRIBE to our YouTube channel. ¡Muchas Gracias! Amelia And JP. JP is behind the camera. utilities and our cell phone bill. pharmacies here in the area. but for some reason it never works correctly. for our mobile phone bill here in Ecuador. so that’s why we went with them. And after we leave here after Amelia pays our bill we’re gonna head down to JEP and pay our utilities. we don’t we just go pay it in person, too. And you have to pay that with cash. and tour a couple pharmacies. It actually hasn’t been that long. rent as far as I’m concerned. As another thing we do pay our utilities in cash here. but we haven’t tried that. If somebody knows let us know. electronics while you’re in the banks here. They have the most amazing dark cherries here! Oh my God they’re like candy! JP: So they aren’t going to shut off our electricity again? but luckily our landlord helped us through all of that. We only had our electricity shut off for what, nine hours? And the funny thing is we had just paid it that morning! made the bill switch. I don’t know. and get some bread from Tosta. A: I know. I’m hungry and I could not wait for a piece. enjoying our delicious bread from Tosta. JP: I know. It’s beautiful here today it. Aid. What do you think JP? except a lot of the stuff is behind the counter. A: Just obviously to minimize theft. of the people working there do not speak English. which is Blue Cross in English. A: Yes and I think..
the little one in our neighborhood. JP: The Cruz Azul. It’s really tiny. They.. Almost everything is behind the counter there. but they get them the same day usually. JP: Usually the same day or the next day. wander up and down some aisles..
JP: And see all the stuff. A: Yes. Go to a larger pharmacy. prescriptions. JP, you want to..? and the protective sheath that coats nerves. doesn’t even require a prescription. feet and there’s no side effects. go back and just buy them normally. JP: Yeah, we just show them the box. A: Like the B vitamins, for example. to help with nerve damage. and that you do need a prescription for that. JP: Car alarms galore. It’s non stop here. A: Anyway, not everything is available over-the-counter. A: Not everything is available over-the-counter. I would assume opioids probably. JP: Amelia’s hungry. I’m hungry, too. A: The bread is delicious. JP: All right. So now you’re gonna go do yoga? gonna do some cooking this afternoon. JP: All right. See you soon. because JP and I have not had them in..
..ages I think a year, year and a half maybe. And they sounded really delicious. pretty quick and easy to make. I haven’t made him in a long time. So let’s run through our ingredients. OK. So I have two beets, which I have to grate. These are raw. I have peeled them. drained.. or drained and rinsed. I have 2 cups of cooked quinoa. One onion that I need to chop still. 1/4 teaspoon salt (kinda hard to see in there). I have 3 tablespoons minced garlic. And then I need to make a flax egg. We use a coffee grinder to grind all of our seeds. We actually do not use this to grind coffee, FYI. seed which is going to make us some flax meal. two tablespoons.. once it’s ground. A: You can buy ground flax meal we just did not. JP: It’s better if you grind it fresh. JP: It loses its nutritional value as it sits. how much that’s going to be, so..
JP: Those are raw, right? A: Yes. Raw peeled. Please make sure you peel them. into our little tube here. So we need a cup of grated beets. Boy these look delicious don’t they? JP: Wow, they’re so red! A: I think we’re gonna have plenty. I still need my food processor so I didn’t rinse it out. going to put in our grated beets, one cup. in so that I don’t end up making a mess. gonna be a very hearty burger JP. your end result it’s kind of gelatinous. still to be a little chunky. Yeah I think this is good. Oh my gosh it smells really good. I’m really excited to eat these! veggie broth until the onions are translucent. All right, I’ve heated a quarter cup of veggie broth. my three tablespoons of minced garlic. That spoon’s a little too big to get in there. I can keep trying but it’s just not gonna work. to use a yellow onion, which I did not have. I think any onion will do. A: I love these red onions. I love white onions and I love yellow onions. They’ll all be delicious, but we can only use one so purple it is. just gonna sauté these until they are translucent. green beans to go with our Beet Burgers. And then we’re going to bake these. We are going to bake them in a 350 degree oven. Alright, I think our onion and garlic is looking good. a couple more minutes. Sorry babies. patties is to add in two tablespoons of flour. And I am using whole wheat flour. and then I will make our patties. This should make six patties. And you can see I’m just molding them. A: But boy they really look good, don’t they? A: I love the color. I’m glad I decided to use a red onion. The nice thing.. these are fragile..
and done and a little crispy. JP: Wow! Those look yummy! A: I know! They look really good, don’t they? JP: They smell good, too! A: They DO smell good! Oooo! This is quite hot! A: This looks delish, JP. A: Do you want lettuce and tomato? A: I’ll give you two slices. A: Well you’re very welcome. A: Pile that right on top. JP: Wow! Looky there! Looks so good! A: I know it’s so pretty! mustard on mine.. and then I’m gonna eat! JP: What kind of mustard? A: Well I’m gonna use regular yellow mustard. I know you like the spicy brown mustard. Any of your favorite condiments will do. A: Avocado would be really good with this, too. JP: Oh, it would be good. JP: All right, let’s eat. A: Next time. Let’s eat! That’s all for today veggie lovers. that you give our beet burgers a try. bell so you get all the latest and greatest. And we will see you next time. 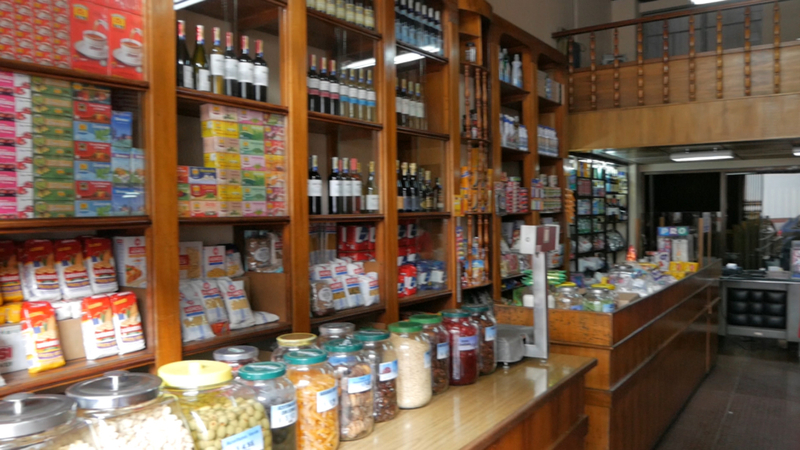 One of the things we love about living in Cuenca is running errands on the weekends. Instead of hopping in a car, driving through traffic and fighting for a parking space, we simply put on our walking shoes and head out to front gate. It’s common for us to log nearly 20,000 steps (that’s about 8 miles) on Saturday and/or Sunday! 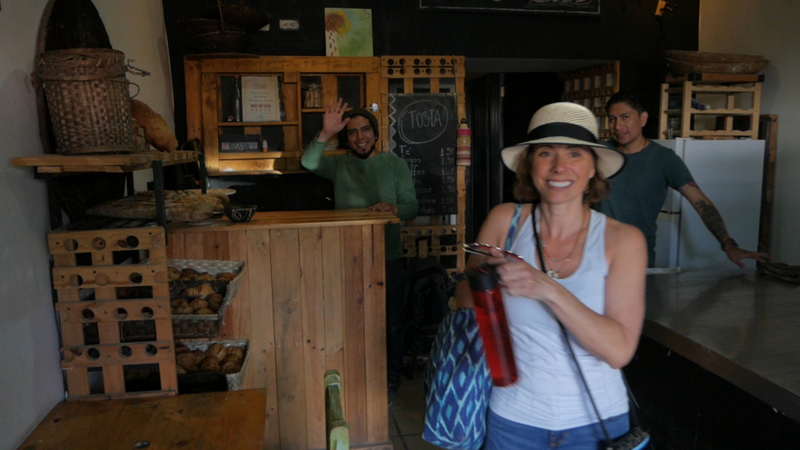 In this video, we ventured down to El Centro to get some papas deliciosas (delicious potatoes) at Mercado Diez de Agosto, and some café y dátiles (coffee and dates) at a speciality store called Café Cubanito across the street from the mercado. Then we walked down through the flower market and Parque Calderon where we saw a marching band. We’re not sure what the band was doing or if it was part of a parade, but it’s common to see things like that here. There is always something to celebrate! 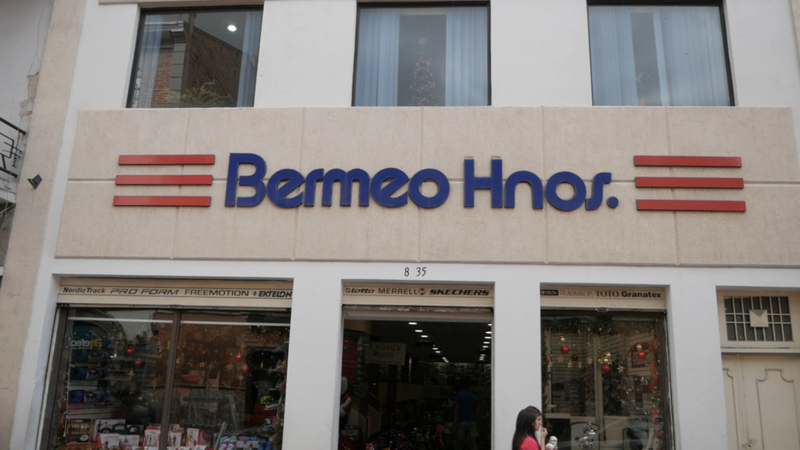 We like Bermeo Hnos. (that’s short for Bermeo Hermanos or Bermeo Brothers) for our sporting good needs. We looked all over town for a pair of athletic shoes for me, and Bermeo was the only store to have them in my size and a color that I liked. Most of the mens shoes run very small here and the colors are very bright (think neon red, pink and yellow). I wear a men’s US size 9 so my feet aren’t that big, but apparently they are for Ecuador. 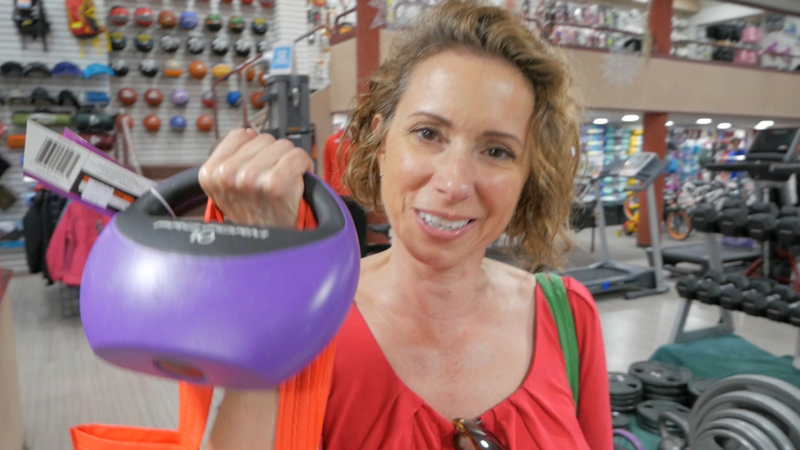 On this trip, we bought some 10 pound weights for our at-home exercises and physical therapy, but we’ve also bought yoga mats, exercise bands and swimming goggles there on previous visits. We walked right by Zatua Miski on our way home and couldn’t resist stopping by for some delicious vegan treats. 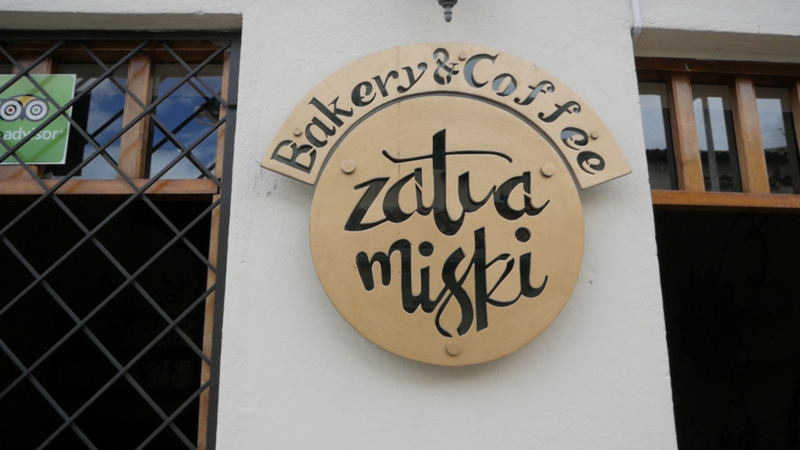 Zatua Miski is an all vegan, plant-based bakery in Cuenca. 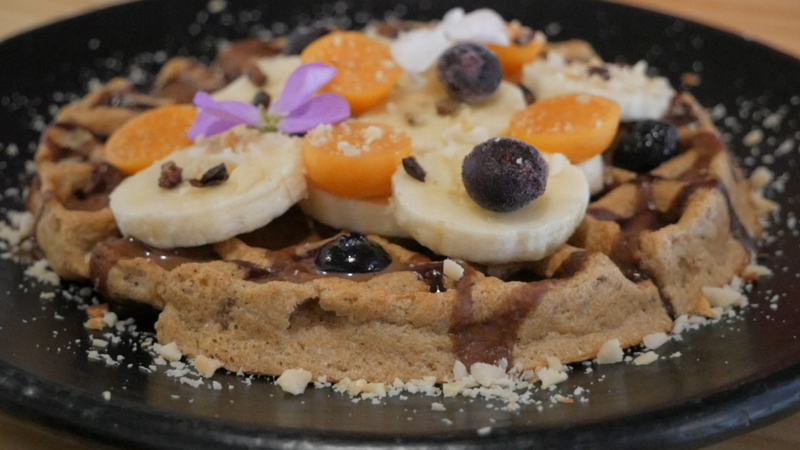 Paola is the artist who creates the cookies, cakes, truffles, waffles and smoothie bowls. 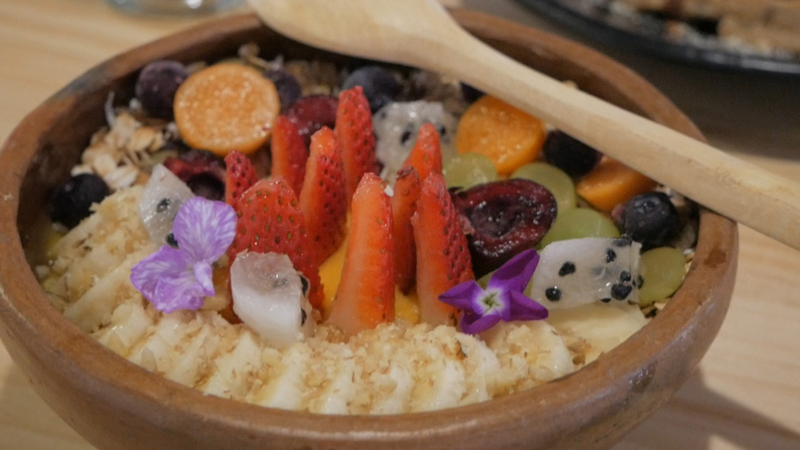 Her dishes are not only decadent and delicious, but true works of art. You’ll want to have your camera ready when you visit. Once the brownies were finished baking, we got dressed up and headed off to Fratello Vegan for some WFPB No-Oil Nachos and Pizza. Rene, the owner, told us he’s in the process of converting their whole menu to oil-free, but for now, we let him know ahead of time when we’re coming by sending him a message through their Facebook page so he can have an oil-free pizza ready for us. On our way home after dinner, we swam upstream against one of Cuenca’s many races. There are lots of 5K’s and 10K’s throughout the year through different parts of the town. Subscribe to our LottaVeg Cooking Channel, too! This weekend is bustling with activity here in Cuenca, Ecuador as we celebrate the annual Cuenca Days 2018 event. 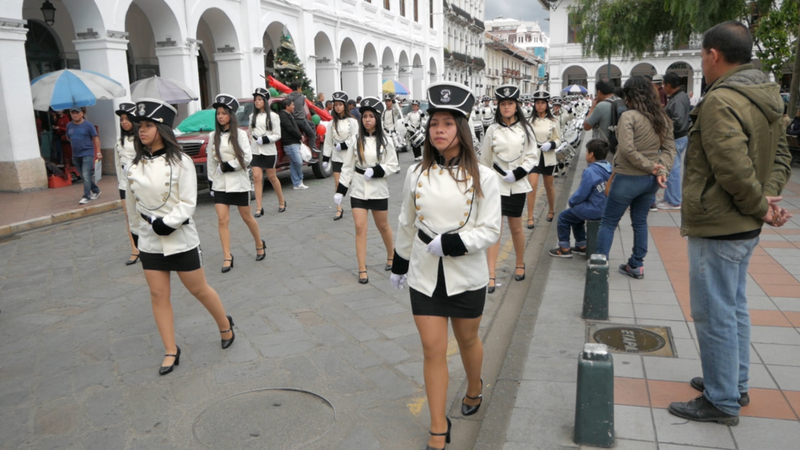 Cuenca achieved its independence from Spain on November 3rd, 1820 and they pull out all the stops to celebrate Independence Day with art fairs, food festivals, parades, concerts and fireworks. Thousands of people descend on our little Andean mountain city this time every year, while many of the native Cuencanos head to the coast to escape the chaos. The streets, parks and restaurants are packed with people, and everyone seems to be thoroughly enjoying themselves. We hope you enjoy seeing the beautiful scenery, and the interesting people during Cuenca Days 2018 here in Cuenca, Ecuador. Today we did another one of our Sunday afternoon city walking tours. 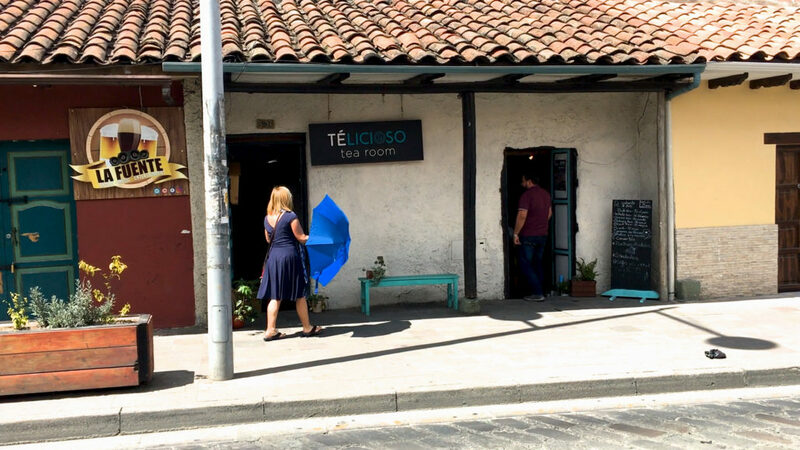 On our way to the Cuenca Flower Market, we stopped by Télicioso Tea Room to get some of our favorite tea. 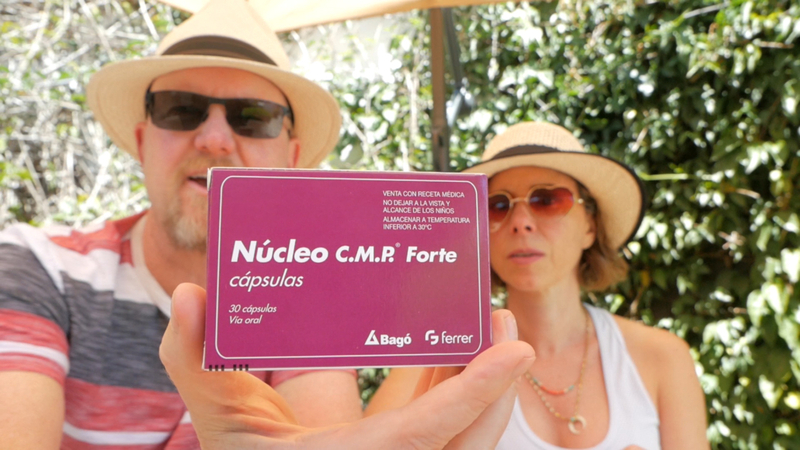 Then, after we bought Amelia some new earrings and some beautiful flowers at the flower market, we went to Simón for some papas fritas y cervezas (we recorded this in March 2018 before I realized I still had high cholesterol, which you can read about in my blog post on LottaVeg: Can Vegans Get Heart Disease?). We hope you enjoy seeing the beautiful scenery in Cuenca, Ecuador, and the interesting people we encounter along the way. We’ve also included some Spanish language learning opportunities for you. Please LIKE, COMMENT and SHARE this video, and SUBSCRIBE to our YouTube channel. Amelia read an article stating that most commercial tea bags contain plastic, so she decided for our health and the environment, we would start making our tea from fresh tea leaves. We first went to Sukasa to get a teapot. It’s a very “American” store located in Gringolandia. We’ll do a video of Sukasa and the surrounding area at some point. 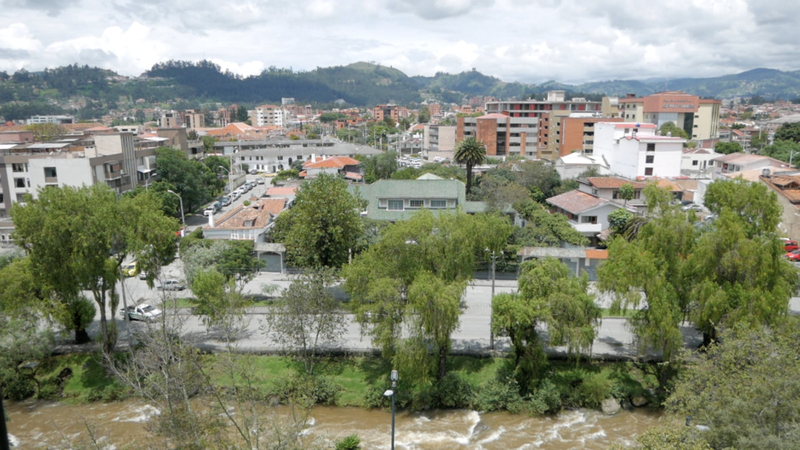 Gringolandia is the area where most of the older gringos live in Cuenca. The next stop after we acquired our new teapot was Télicioso Tea Room. 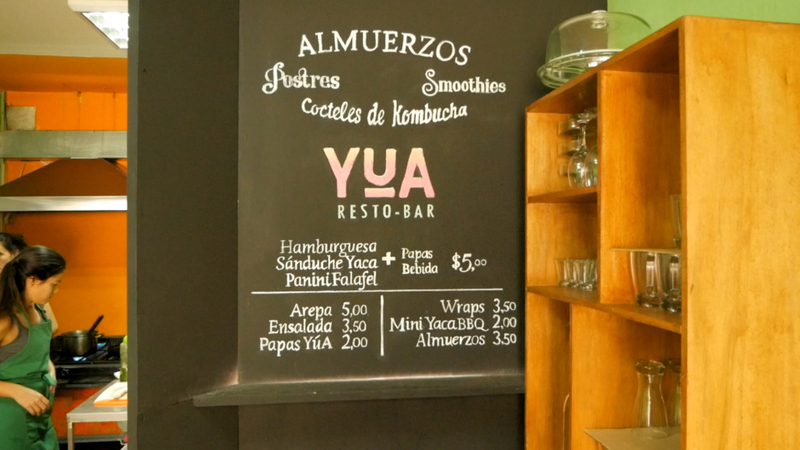 It’s located next door to Café Libre, one of our favorite plant-based, vegan restaurants in Cuenca. 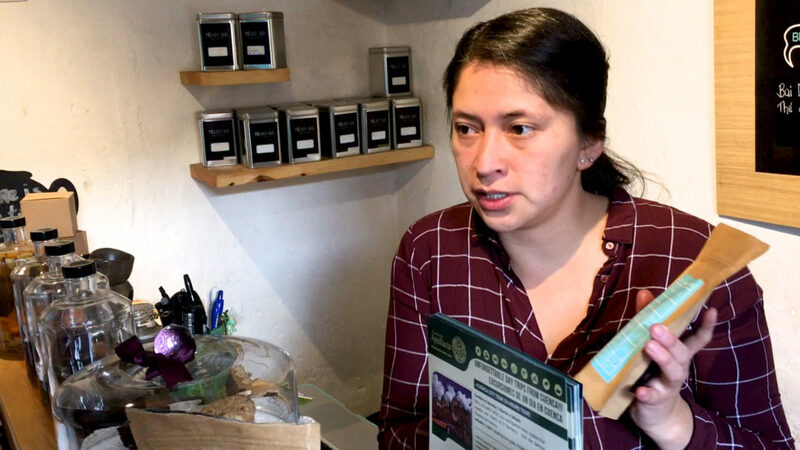 Télicioso has a wonderful assortment of fresh tea leaves. 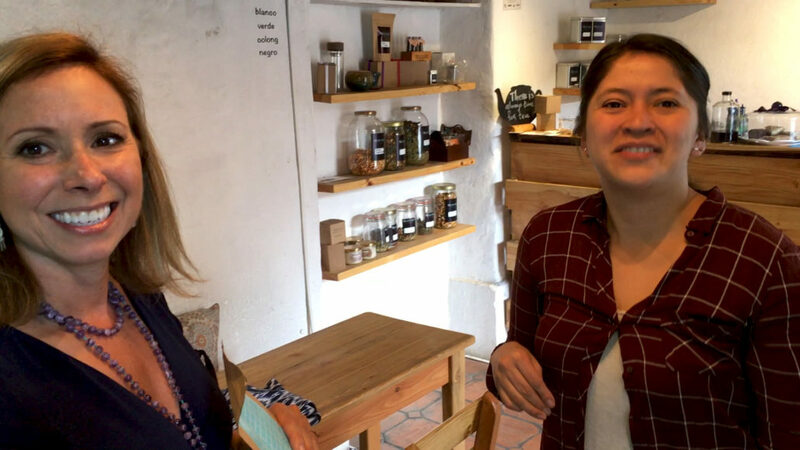 The owner, Katherine, speaks fluent english and is very knowledgeable about tea. She has some of the same flavors and a few new ones each time. You can reuse your tea bags so be sure to take them with you. She’ll also tell you how to measure the tea and how much to use of each kind. While you’re waiting, you can channel your inner child and enjoy a little swing time like Amelia is doing in this photo. 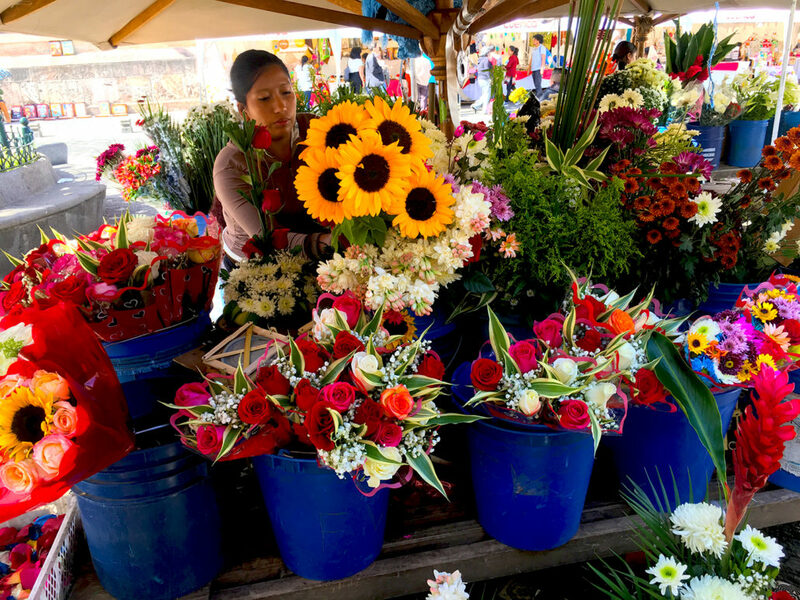 One of our favorite places to visit in Cuenca is the Flower Market located across the street from the New Cathedral. It’s so beautiful that it topped the worldwide list of National Geographic’s Top 10 Outdoor Flower Markets. It truly is breathtaking. Many of the booths at the Cuenca Flower Market are run by indigenous Ecuadorian women adorned in their traditional garb as you can see in the video. But many of the younger women wear western style clothes consisting of jeans and long sleeve t-shirts, like the woman in this photo. 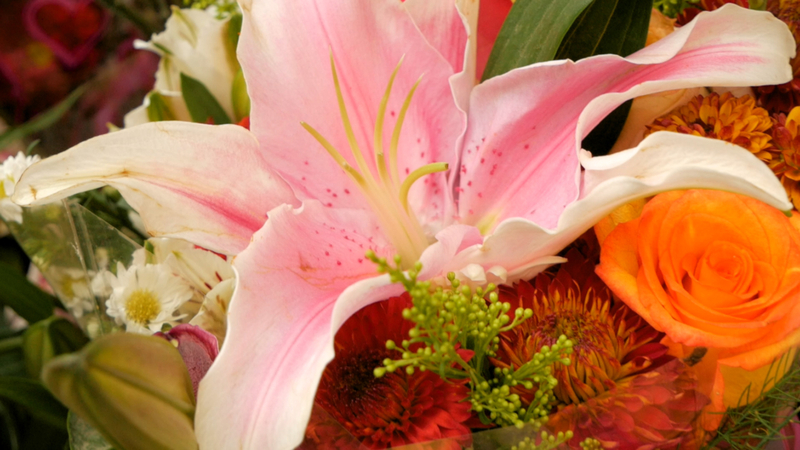 You can buy all sorts of flowers by the bundle or in premade arrangements at the Cuenca Flower Market. 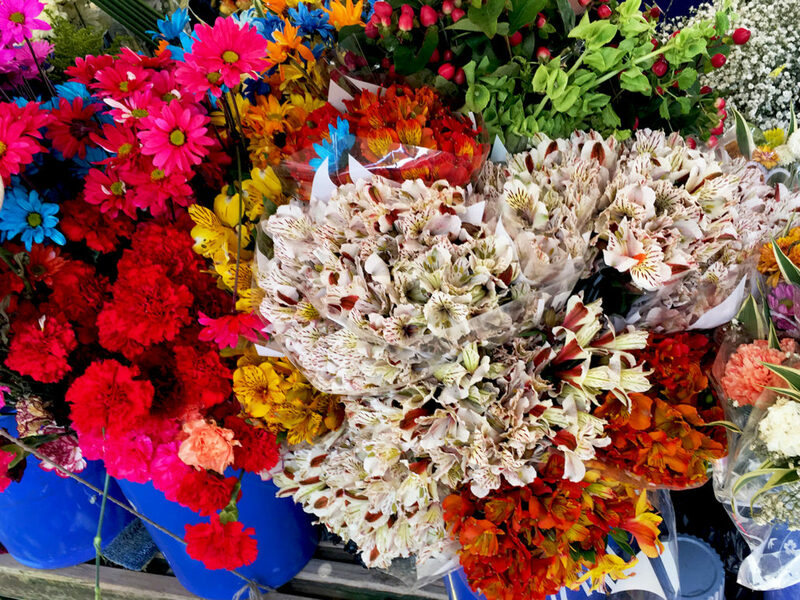 The women who work at the market are always busy making new arrangements, but they’re eager to help you pick out the perfect flowers for your home or special occasion. Ecuador is the world’s third largest exporter of cut flowers and they’re incredibly abundant here…and reasonably priced. A dozen roses typically cost less than $5, and they’re ridiculously beautiful. The buds are huge and they’ll last for as long as two weeks. Place them in a central location in your house and their aroma will welcome you home when you open the door. The lilies that Amelia bought in the video also smelled fantastic. We could smell them all over the house! That bundle cost us $8, which is more than we usually spend on flowers, but they were also more exotic than the roses we usually buy. On the day we went, the roses looked a little wilted so we opted to try something new. 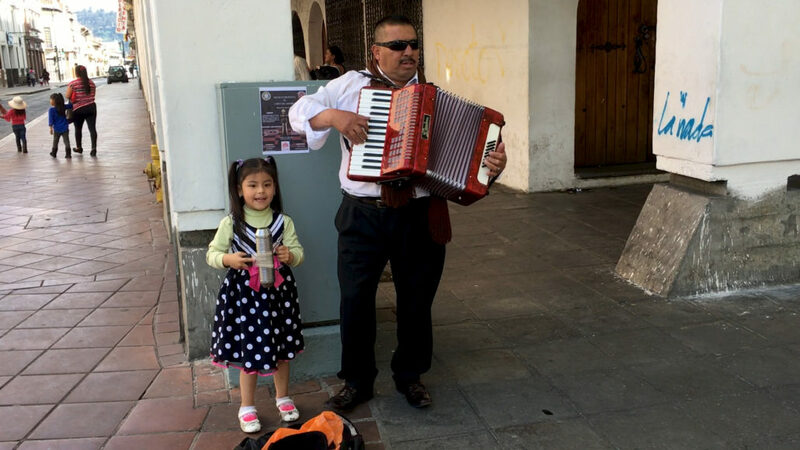 A lot of street entertainers gather near the New Cathedral and the Cuenca Flower Market, like this father/daughter duo. You have to watch the video if you haven’t already. Her little dance is ADORABLE!!! 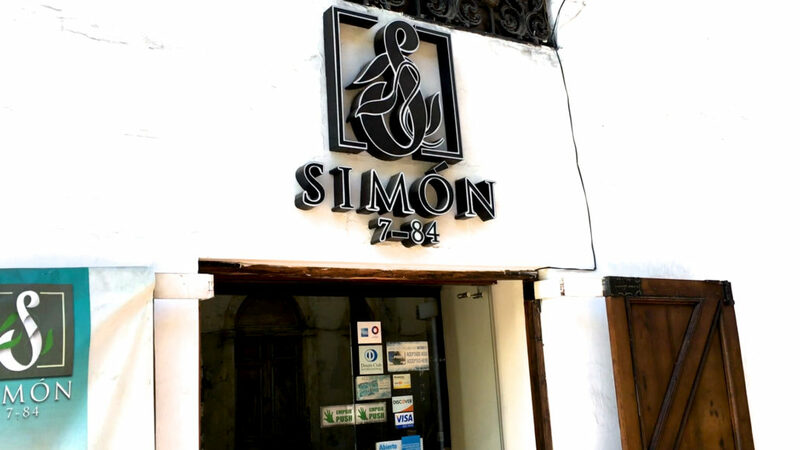 When we visited Ecuador on our exploratory trip, Simón was the very first restaurant we tried for dinner. They don’t have much in the way of vegan options, but they do have a delicious vegetable soup and a vegetarian panini that can be veganized by leaving off the queso y mayonesa (cheese and mayo). They also have some of the best papas fritas (french fries) in all of Cuenca. Most of the papas fritas are pan fried in Ecuador, rather than deep fried. That means they aren’t nearly as oily. Plus, the papas are far more delicious here, which means the fries are muy delicioso. We know these aren’t healthy, and neither is the beer, but we’re not perfect. We eat a whole-food plant-based no-oil (WFPBNO) diet at home, but we like to enjoy some delicious papas fritas and cold beers on occasion (at least we used to before we found out about my high cholesterol). It probably looks like we enjoy it more than we actually do since we tend to record videos when we go out to restaurants, but these are (were) a rare treat for us. Besides, we want to show people that you can still enjoy your favorite food and drinks, and still be vegan. Our friend Rosy from Fratello Vegan verified that all of the Club beers, as well as Pilsener beers, are vegan…so bottoms up! Every place we’ve ordered papas fritas in Ecuador serves them with mayonesa, and most of the time it’s in a small condiment bowl. That means it probably (hopefully) gets thrown out when we don’t eat it. 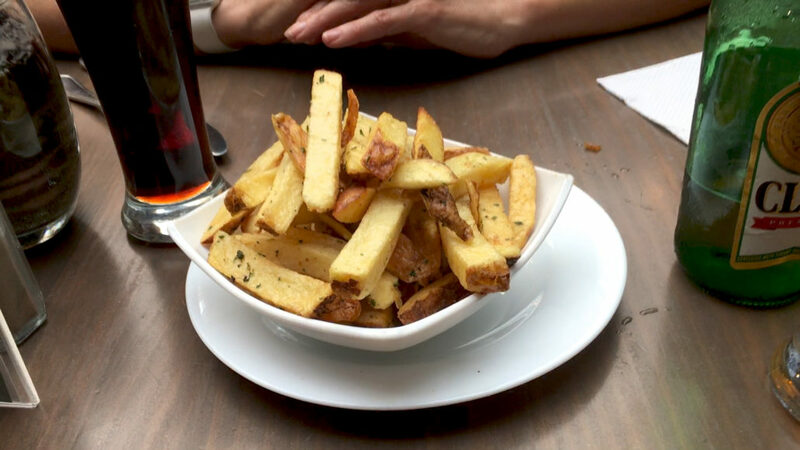 Rather than waste it, we order our papas fritas “sin mayonesa” (without mayo). The server always looks at us funny and usually still brings it anyway, but at least we try not to be wasteful. 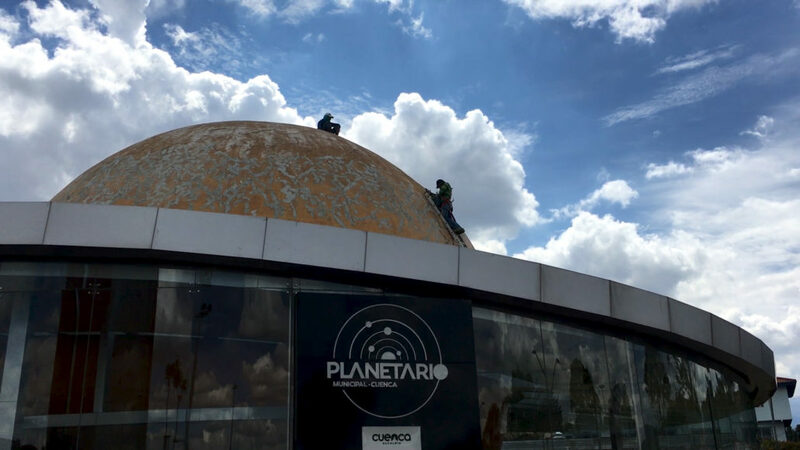 Cuenca’s Planetario is located in Parque de la Madre. We haven’t been inside yet, but the outside looks cool. They just finished giving it a fresh coat of Martian red. We’ll take you inside someday. This photo was taken pre-paint job, but I thought it looked out-of-this-world with the crazy clouds mixed with blue sky behind the dome and the guy sitting on top of it. The bottom of that ladder wasn’t touching anything. It was tied to the top of the dome with a rope and dangled alongside while the guys climbed on it to strip the old paint and then repaint it. 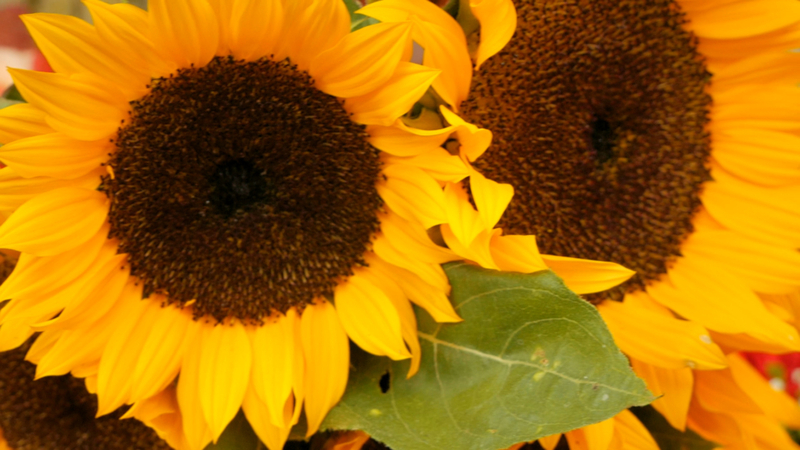 We hope you enjoyed our visit to the Cuenca Flower Market, Télicioso and Simón today. Please remember to like, comment and share our video, and also subscribe to our YouTube channel to help us spread the word about veganism. If you’d like us to make a video about something specific or if you have questions, please let us know in the comments. ¿Cómo están? – How are you? Bien. ¿Cuál es su nombre? – Well. What is your name? Bienvenidos a mi sala de té. – Welcome to my tea room. Necesitamos practicar mucho. – We need to practice a lot. ¿Cuál es el nombre? – What is the name? Thank you @Starbucks!!! We walked all over this terminal in the #Amsterdam airport and you had the only vegan options! A delicious hummus falafel wrap and a decadent #vegan berry bircher! ALL airports need more #veganfood !!! 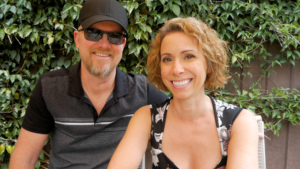 Amelia and JP are gringo vegan expats living in Cuenca Ecuador. We enjoy sharing our daily lives and interesting adventures travelling and living in a foreign country. © Copyright - VegansAbroad.com. Powered by OnlineStir.com.